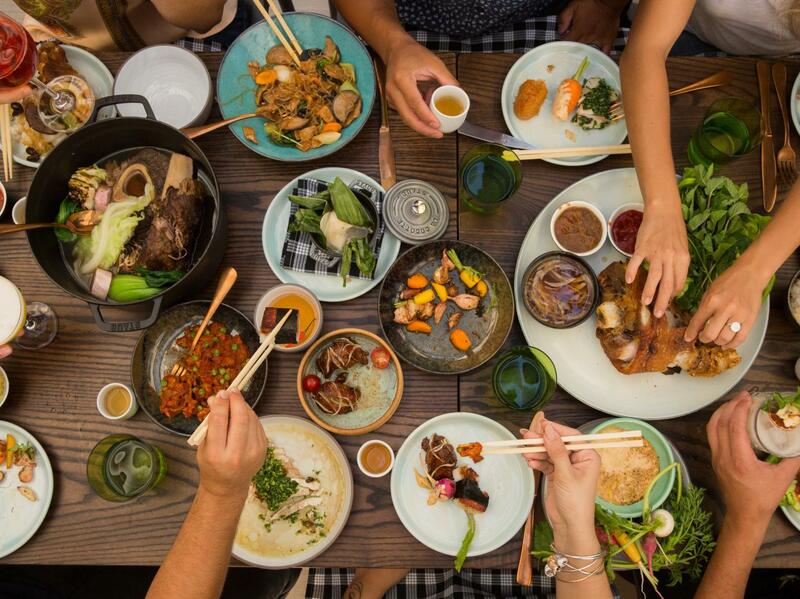 Getting together with friends and family for an incredible meal is one of life’s greatest joys. But with all the new restaurants that have opened in the last year, it can be a little daunting to pick one that’s right for you and your people. Not sure where to start? 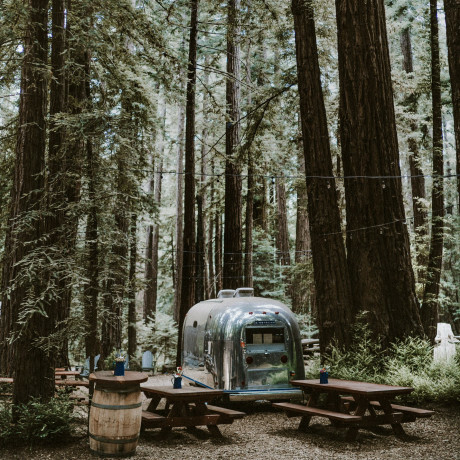 Let us help you find a place. 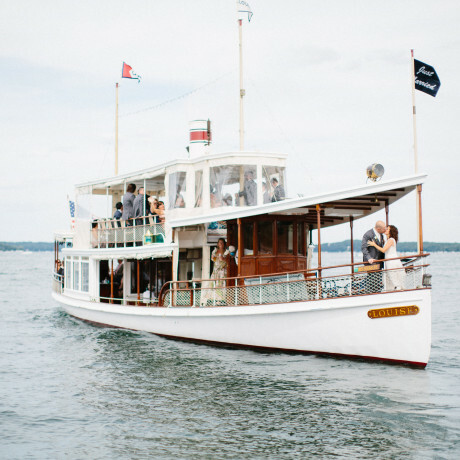 Whether you’re celebrating your partner’s birthday, coordinating your class reunion, scheduling an important business meeting, or simply looking for a cocktail spot to hit up with your friends, we’ve got you covered. Visiting Portland and craving a late night with your local friends over bourbon and burgers? Head to Abigail Hall. 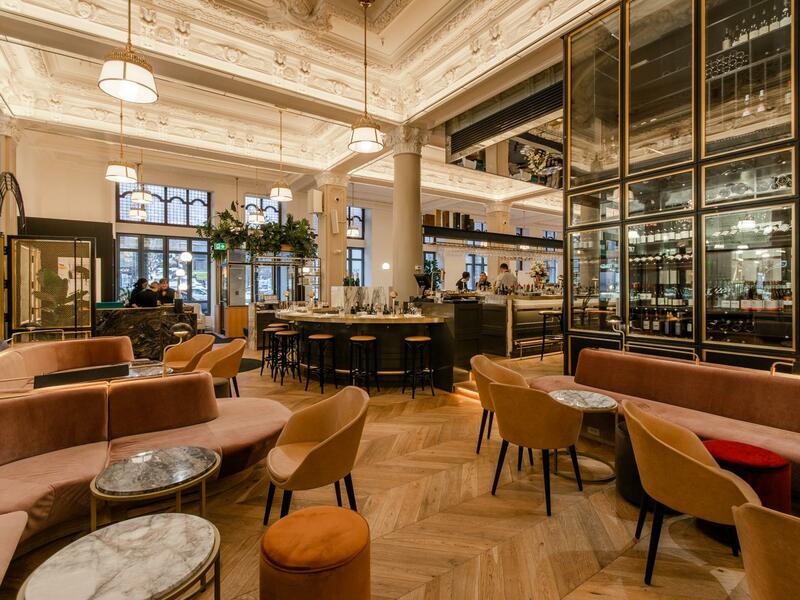 Want to introduce your work friends to buttermilk biscuits and crispy fried chicken in a sophisticated space? 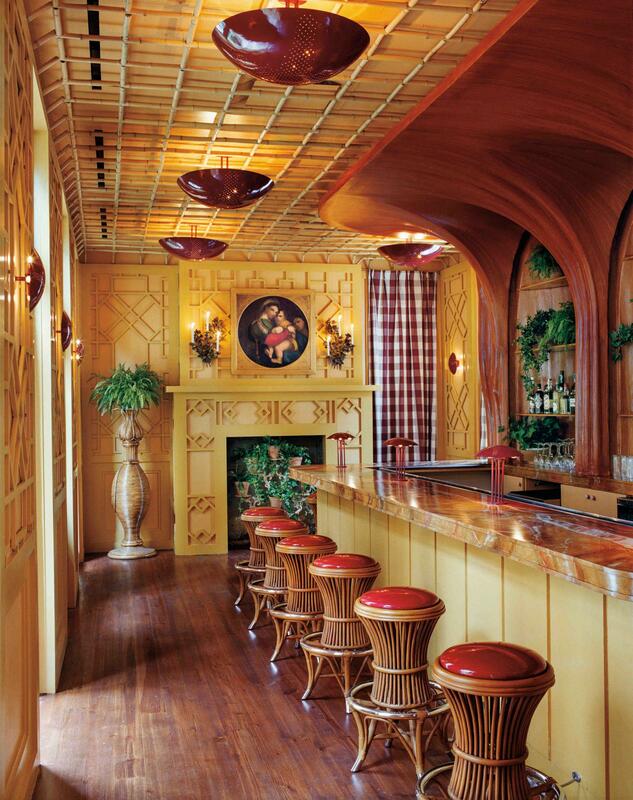 Try Garden & Gun Magazine’s clubhouse in Atlanta. 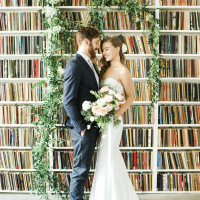 Looking for a romantic, vintage-feeling space in London to host a small post-elopement party? Cocktails at Cora Pearl could be your jam. You can even dine inside an old bank vault in Porto just because you feel like it. Read on below to discover the new restaurants we’re most stoked about right now. Some have celebrity chefs, others have chocolate babka. All have a space that could be right for your next get together. 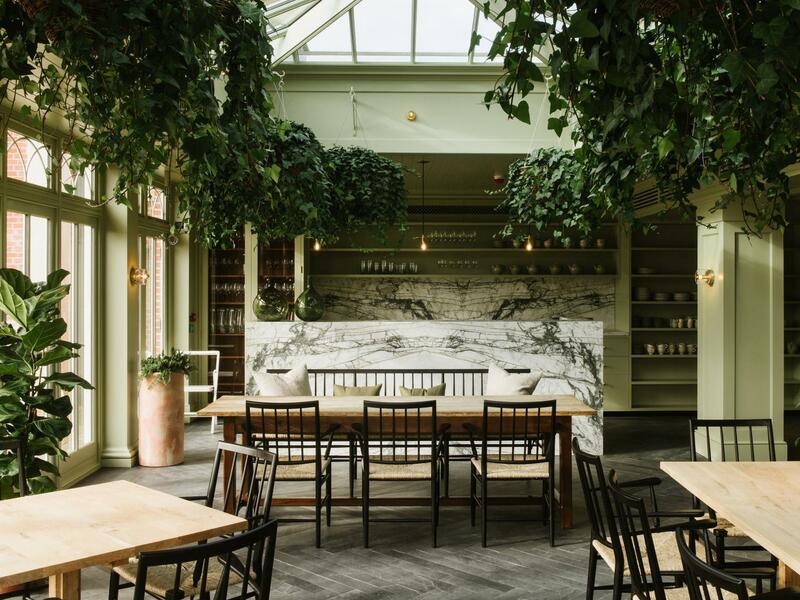 An ambition for self-sufficiency drives the menu and offerings at this farm centric restaurant in Hampshire. Part of a meandering estate hotel with beautiful English gardens, Marle stands solidly on its own with an incredible menu and a feel that’s entirely connected to its landscape. 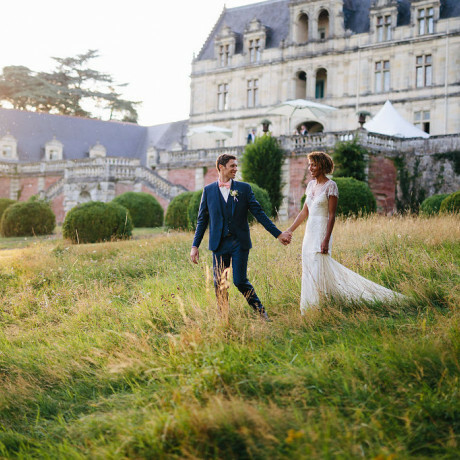 Group Dining: The outdoor terrace overlooking the grounds is a pretty spectacular spot for watching the sunset with your nearest. 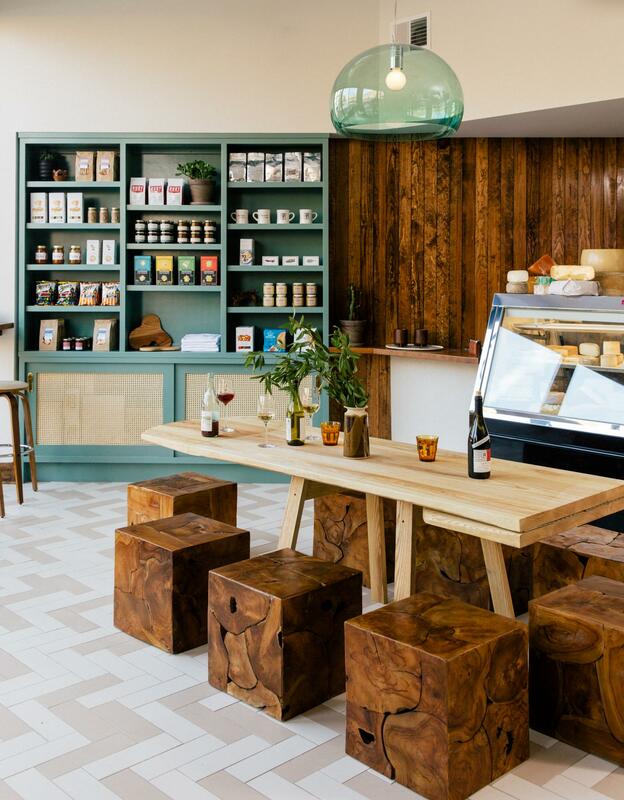 Set in Chicago’s Ukranian Village, this wine shop, all-day eatery and market is a comfortable, welcoming hangout any time of day. The dining menu ranges from sandwiches and salads to pastas and roasted chicken. Group Dining: The 8-seater wood table at the front of the shop makes wine tasting or casual dining with friends fun and easy. Colita’s owners tout food that’s “Tex-Oaxacan,” bringing in flavors and Moles of Mexico served alongside Texan barbecued meats. 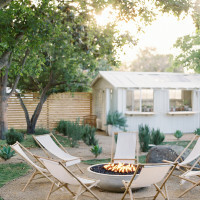 Expect bold, creative and slightly OTT cocktails -- one is garnished with bubbles and a duck bath toy -- served in a modern-rustic setting with a living wall. 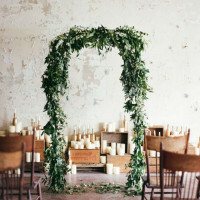 Group Dining: Groups of 4-8 will find this spot works well for a small celebratory occasion like a birthday or milestone. The dining room is pretty small, so you’d want to look into a buyout if you’re planning anything with a larger group. 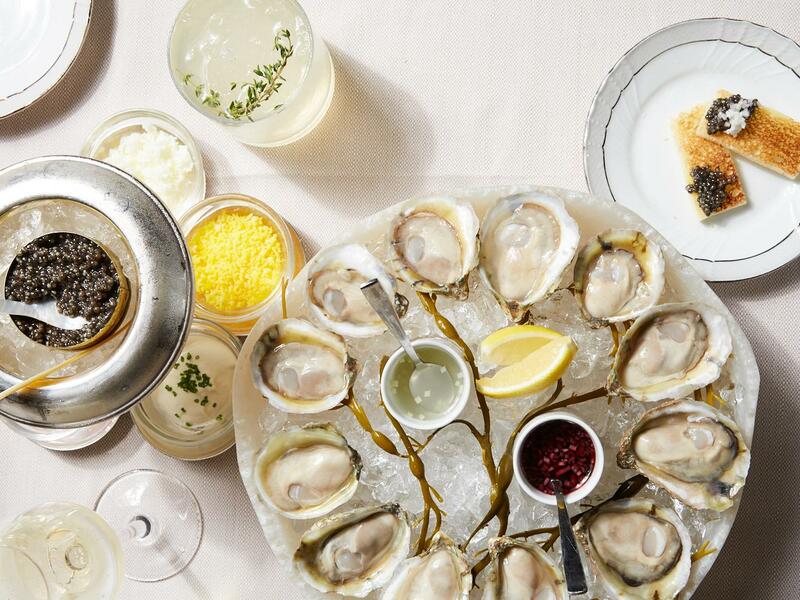 The team behind Clark’s Oyster Bar in Austin recently opened up shop in Aspen, bringing with it a year-round oyster and caviar bar, freshly baked sourdough, lobster rolls, burgers and more. 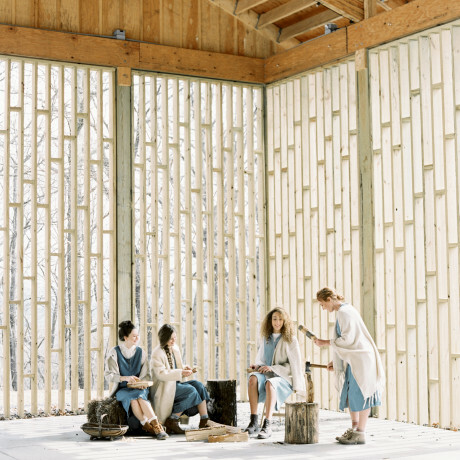 Though it’s located in what looks like a little old wood chalet, the vibe inside feels totally coastal. Group Dining: No private dining options here unless you buyout the restaurant, but casual group dining in the shared space is comfortable with a working fireplace, long tables and banquette seating. 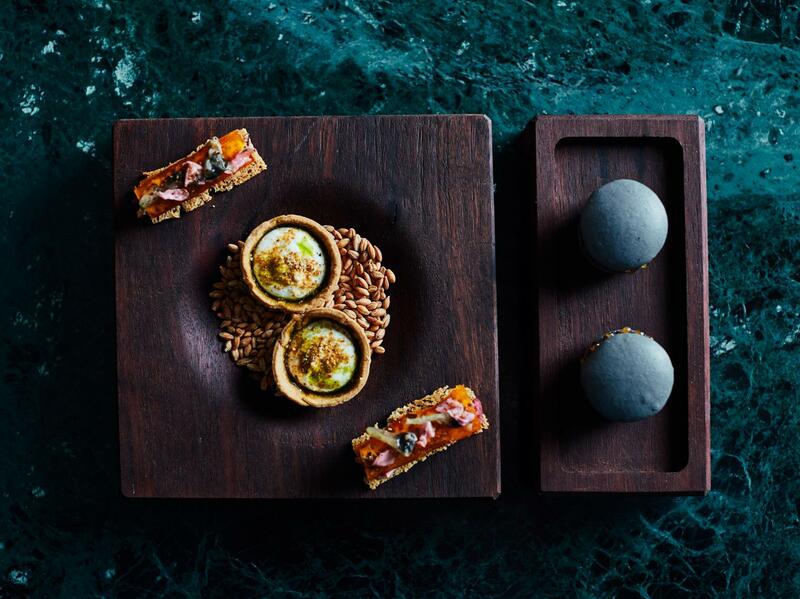 This fine dining restaurant in Cape Town promises to take you on a culinary adventure. 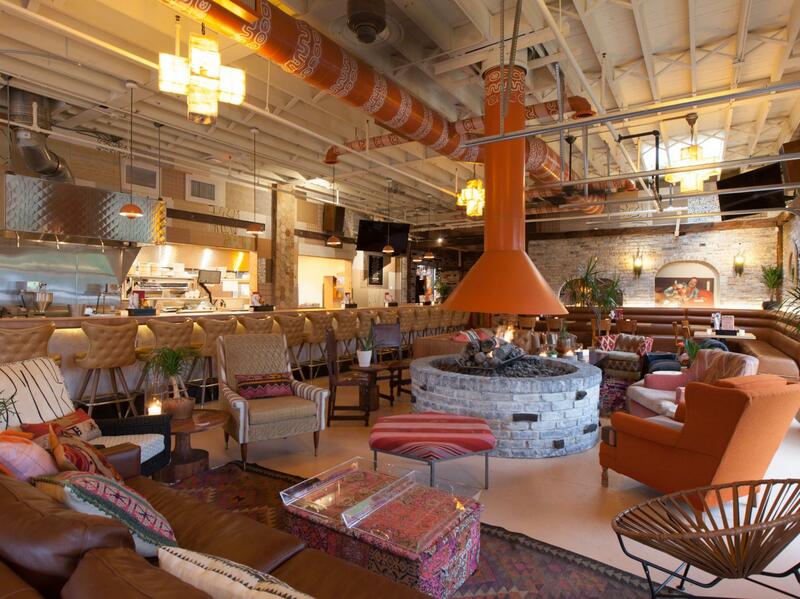 FYN includes vegans on said adventure, offering alternative menus for the plant-based crowd. Group Dining: If you’re rolling with a group, check out the mezzanine for an interesting setting that feels like your own space. 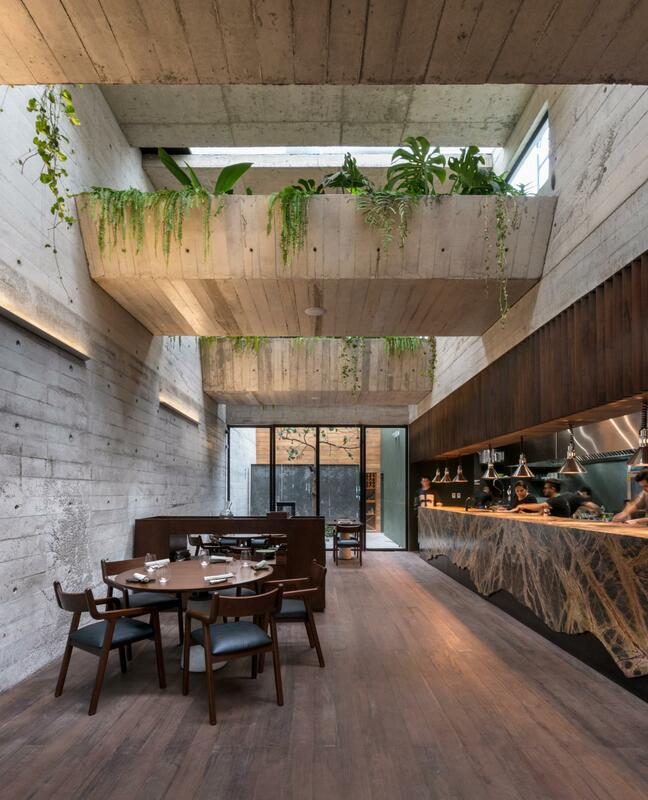 Dining at Statera is akin to getting a crash course in the terrain, products and people of Peru. The restaurant is entirely devoted to all things local and the space makes dining into an experience of simple, modern beauty. 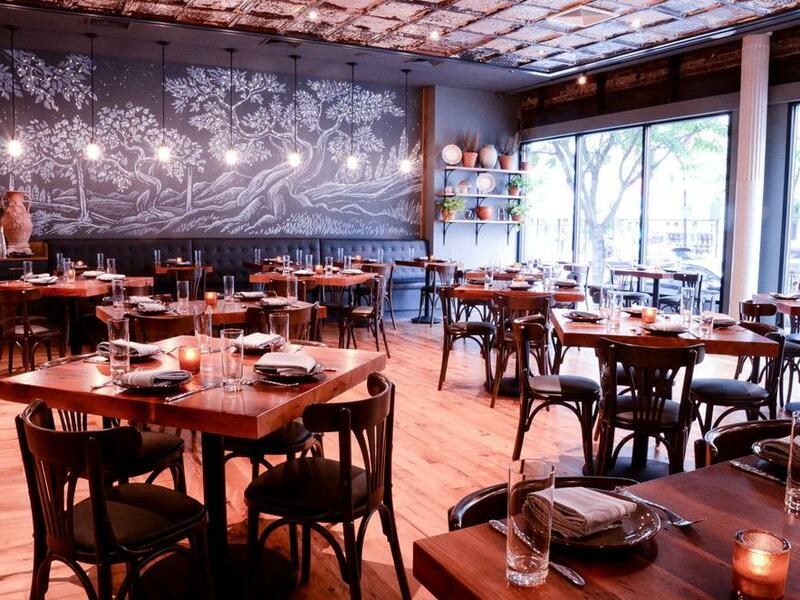 Group Dining: Statera accepts reservations for groups of up to 8 people. Don’t miss the suckling pig and root honey! Housed in the Austin Motel, Joann’s Fine Foods offers comfort food staples with a Tex-Mex meets California diner approach. 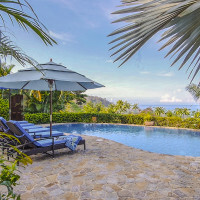 The restaurant runs as an all-day restaurant with a patio space, courtyard bar and a pool bar. Group Dining: For dining with a smaller group, the patio is going to be your best bet. For larger parties, you can book exclusive use of the restaurant, patio, courtyard or pool, or coordinate a buyout of the whole place. Lunch at Chickadee includes salads, pitas, dips and mains that rely on robust Mediterranean flavors as an anchor. 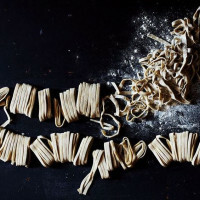 Dinner follows suit with offerings expanded to include housemade pastas and hearty, rustic mains. Group Dining: If you’re planning to head in with a group of 7+ guests, book in advance and you’ll be opted into the seasonal sharing menu, exploring the best bounty in a party-approved format. 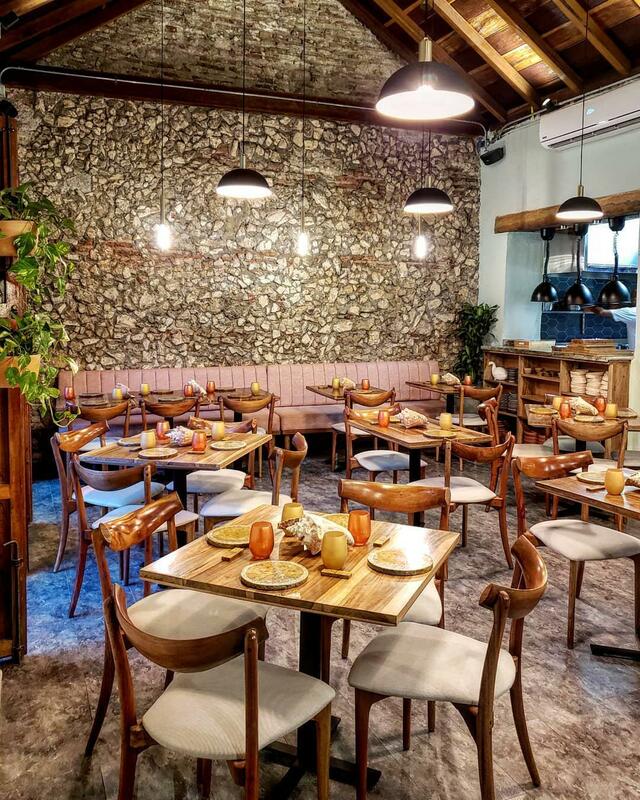 Wood-fired dishes, pizzas and housemade pastas in a Southern Italian style line the menus of San Morello. An elegant space and lively open kitchen elevate the buzz of this neighborhood spot. Group Dining: The golden private dining room at San Morello has its own entrance, cocktail bar and family-style menu. 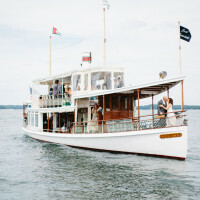 For a seated dinner, you’ll be able to bring along 36 guests (or 45 if you’re just here for cocktails and hors d’oeuvres). 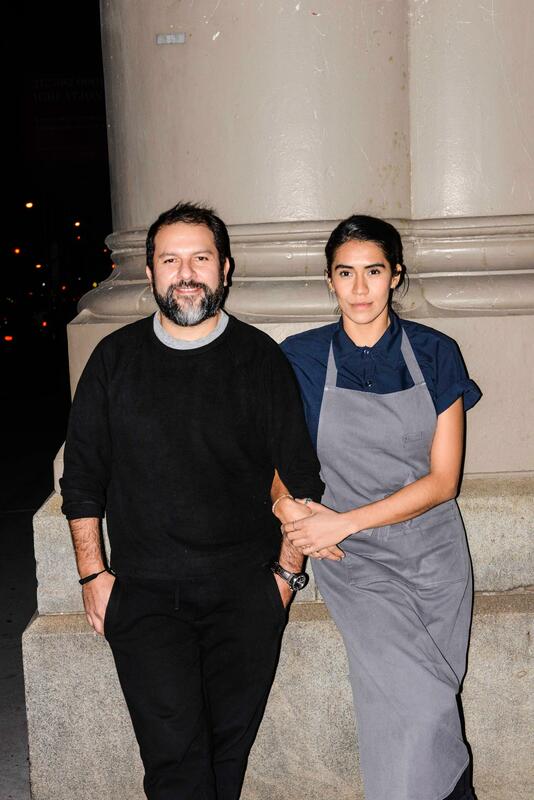 New Orleans husband-and-wife restaurateur duo Justin and Mia Devillier (La Petite Grocery, Balise) are behind the opening of Justine brasserie in The Quarter. 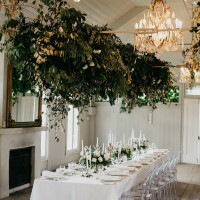 The 200-seat restaurant has a beautifully designed main dining room, back dining room and outdoor courtyard that’s filled with lush, tropical plants. The menu is driven by classic French family food and drink. Group Dining: If you’re planning a private event for a small group, the back dining room or courtyard would be ideal, but there are plenty of options at Justine for cocktail-style and seated dining events alike just depending on your group’s size and needs. They’ll customize something that works for you. 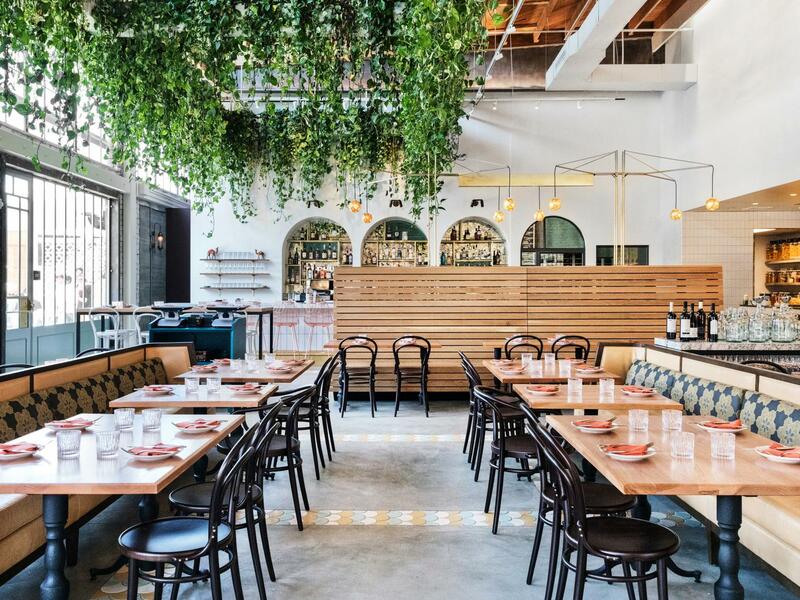 The team behind LA’s lauded Bestia has gone and knocked it out of the park again, this time opening Bavel to major acclaim in the Arts District. 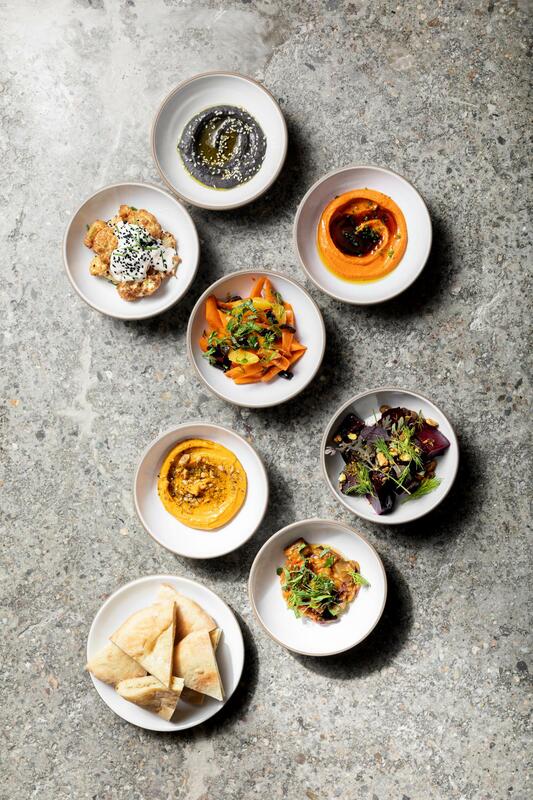 The fare at Bavel, which opened in April 2018, draws on the chefs’ backgrounds from Israel, Morocco, Turkey and Egypt. 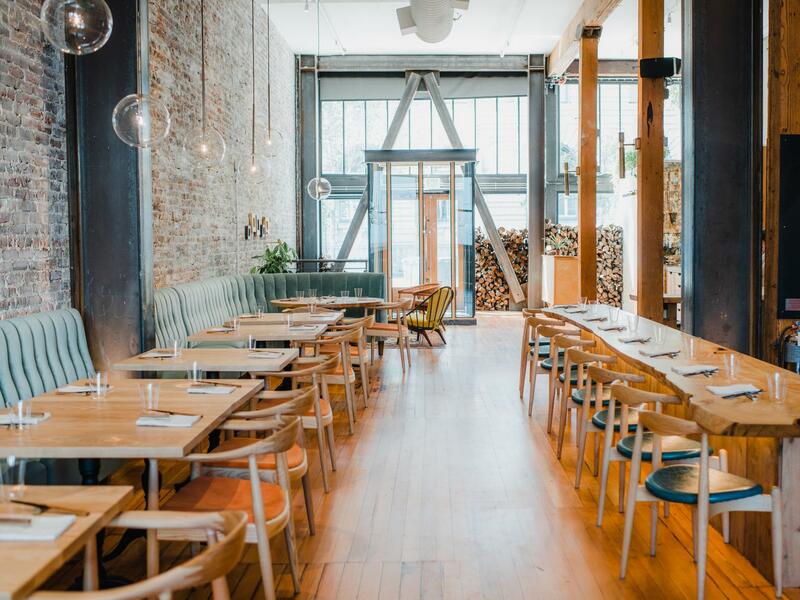 It seems only natural that the place is a semifinalist on the James Beard award nominee list for Best New Restaurant, as it’s garnered infinite praise from various media outlets and diners alike. Private Dining: There’s no private room, but groups of 9-14 diners can be seated at large communal tables in the main dining room. The covered and heated patio is another great option for groups of up to 22 guests. For something private, buyouts are available during lunch hours and some dinner occasions. 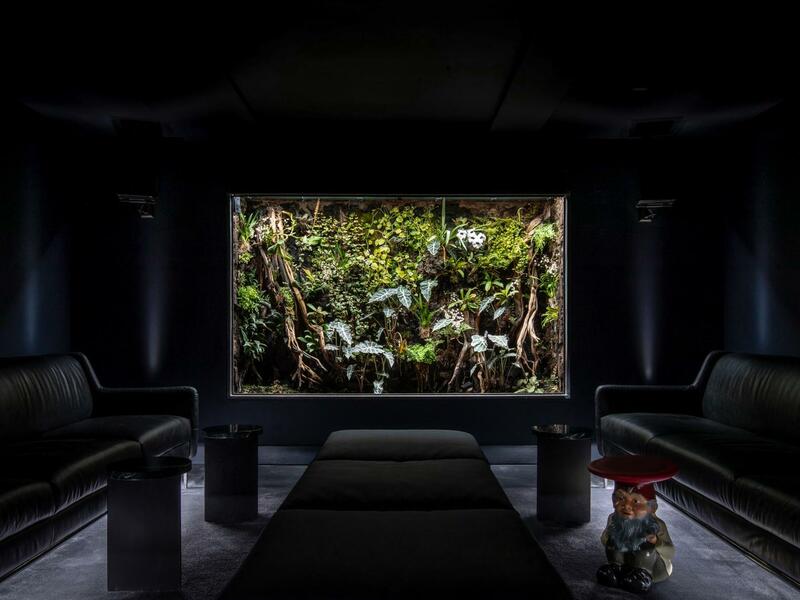 This Korean tasting menu restaurant in Murray Hill has two parts: upstairs is the Atomix bar with an a la carte snack menu and cocktail service; downstairs is the utilitarian space in which the chef’s tasting menu is served to 14 guests at a time. 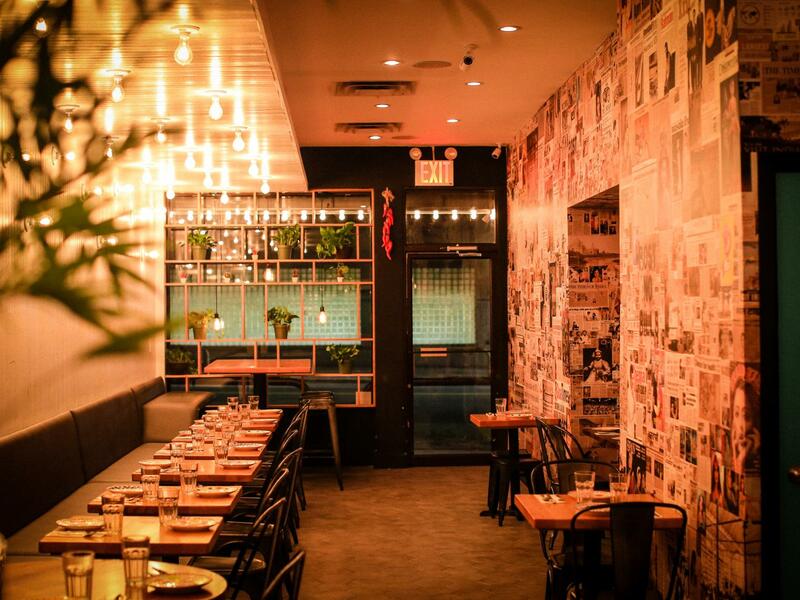 It’s this section that’s gotten Atomix listed as a semifinalist for a James Beard award for Best New Restaurant. Group Dining: The communal tasting experience would be fun to do with a small group, while the Atomix bar is walk-in only and best for casual cocktails with a group. 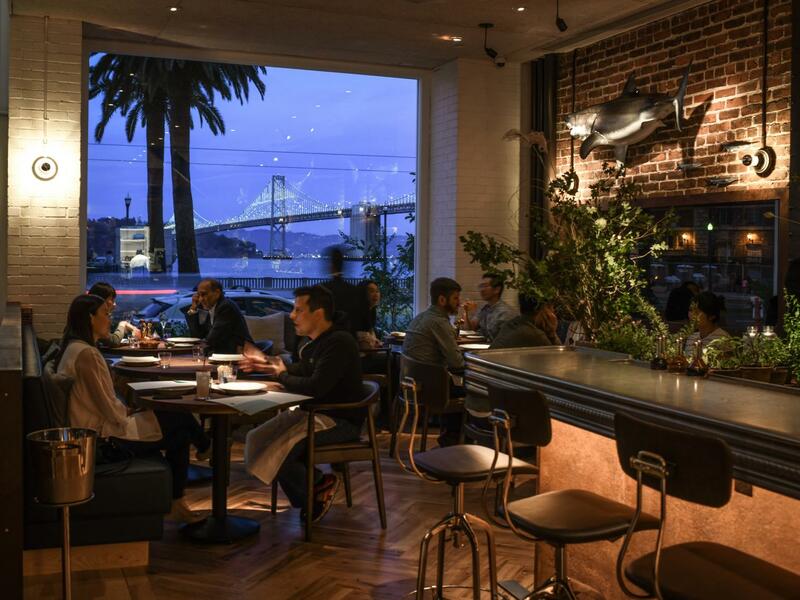 There’s a real PNW influence felt throughout the restaurant and the menu at San Francisco’s Birdsong. 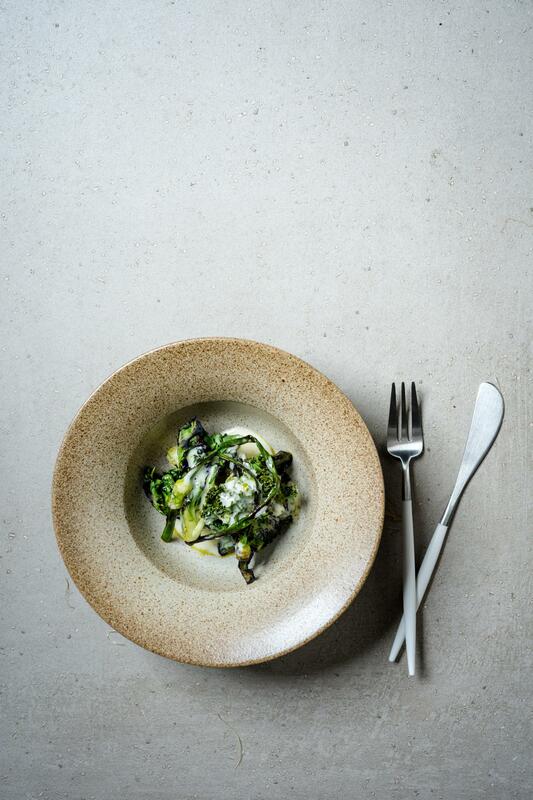 Tasting menus are the staple here, with an option to go full-scope with 14-16 courses or pare down to five courses if you book on Tuesday, Wednesday or Thursday. 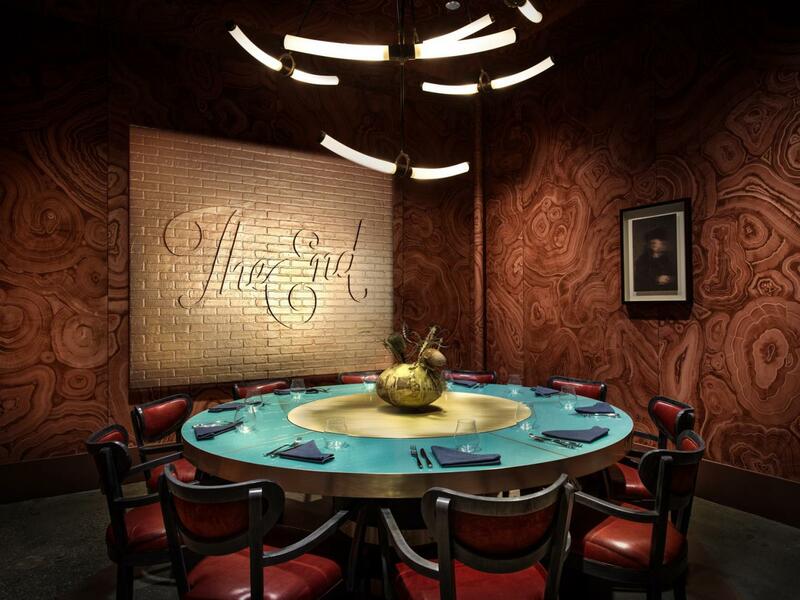 Group Dining: The Starling room is great for private group dining with 6-10 guests and a five-course tasting menu. For groups of 11-20, the Merlin space is roomier and has a lounge zone. Whole restaurant buyouts can also be booked, suitable for up to 50 guests. The kind of place you go to before a theater show or after attending a formal event, Astair provides a beautiful, swanky space for sipping cocktails and listening to jazz. As for the food, think caviar, escargots, tartines, and foie gras. 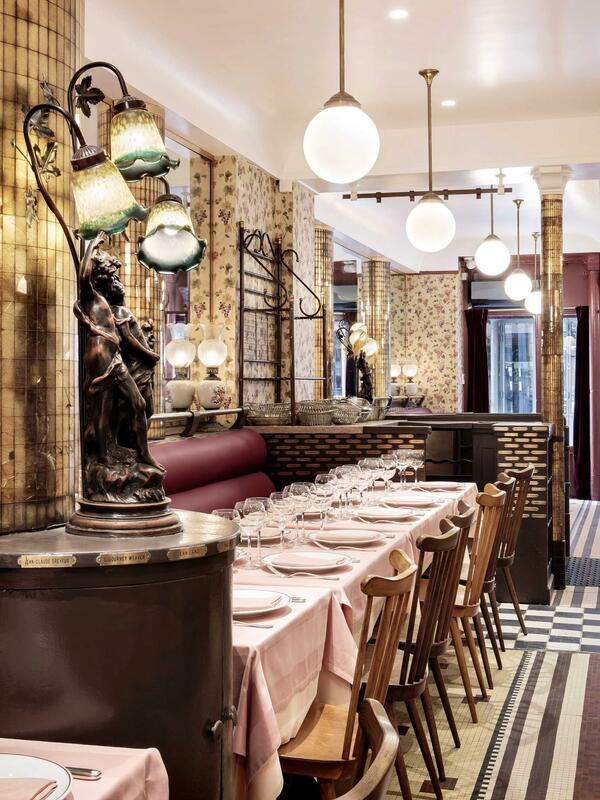 Group Dining: The menus here are classically Parisian, making this an easy stop for a group of first-time visitors to the city. 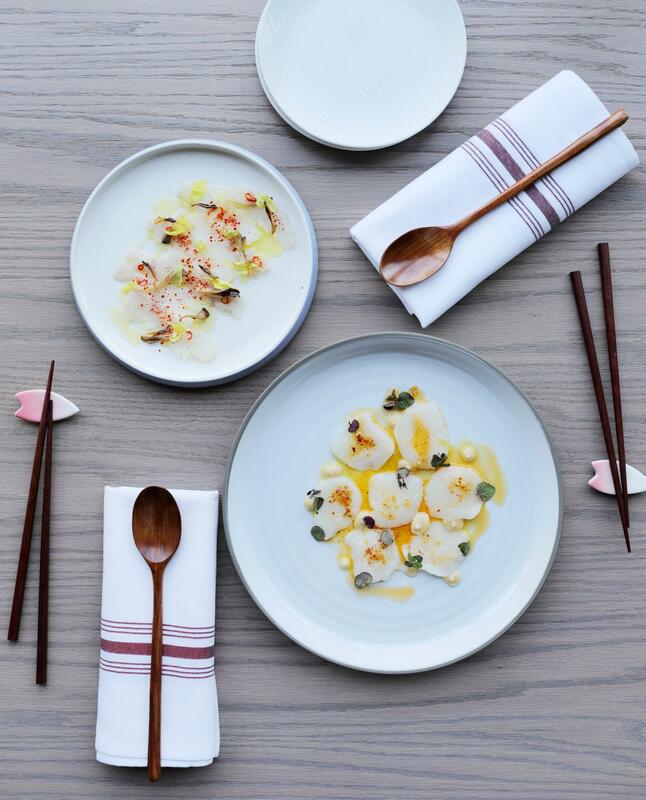 Set in the heart of LA’s Koreatown, Openaire offers poolside greenhouse dining with shareable plates by two-star Michelin Chef Josiah Citrin. Group Dining: The indoor/outdoor space has round tables that are great for groups of four, while larger parties can be accommodated in the banquette seats or at a communal table. 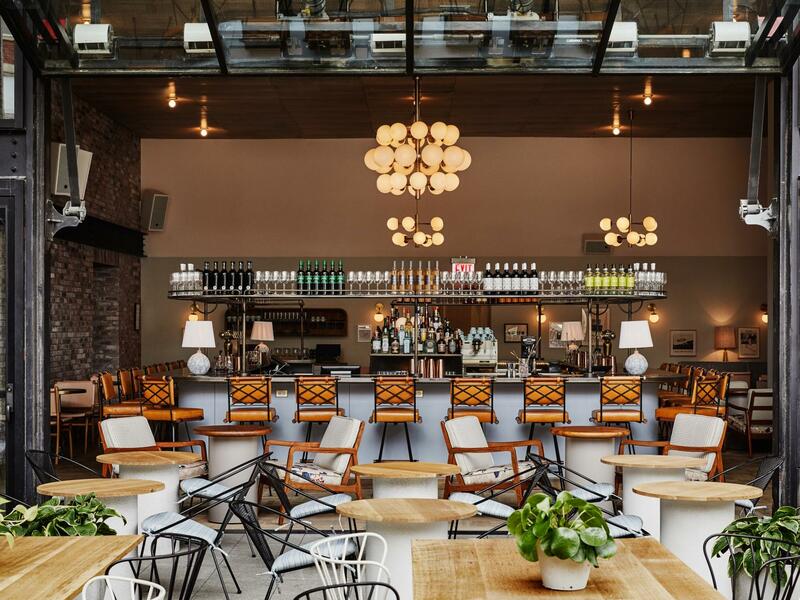 It’s all-day dining indoors and out at Klein’s in Williamsburg. 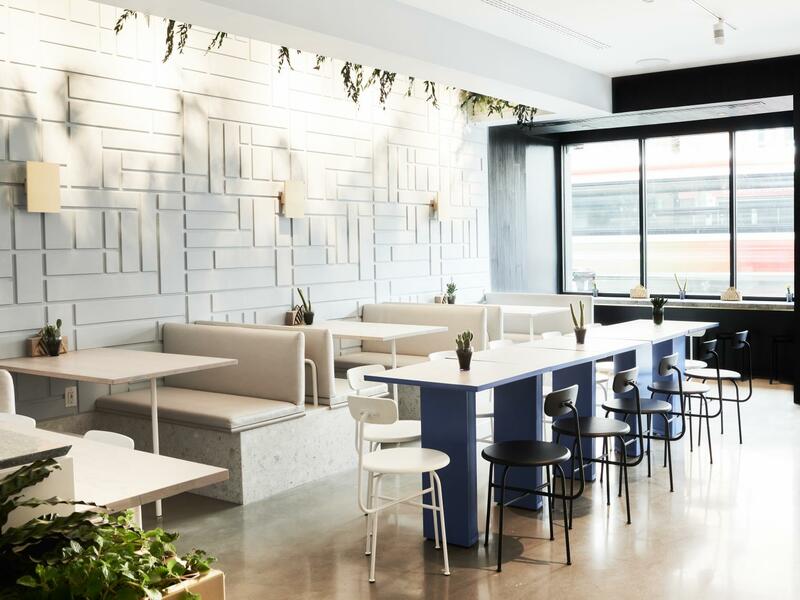 Part of The Hoxton Hotel, the space is modern, casual and approachable while the menu is very much the same with its sandwiches, salads and mains. 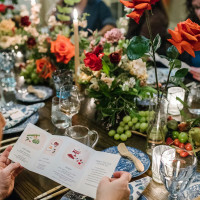 Group Dining: There’s a private dining space that’s perfect for a small, intimate crowd celebrating something like a birthday, engagement, work milestone, or mini networking setting that inspires collaboration and conversation. This Parisian style brasserie in Amsterdam’s De Pijp neighborhood sets a sophisticated tone with its golden velvet booths and dramatic dark walls. 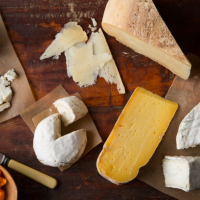 The menu here is all about aged meats, fresh fish and a Burgundy-focused wine list. A menu favorite is the beef Wellington, which requires a 24-hour head’s up to order. Group Dining: This place is practically built for special occasions, spanning easily over multiple spaces indoors and out. 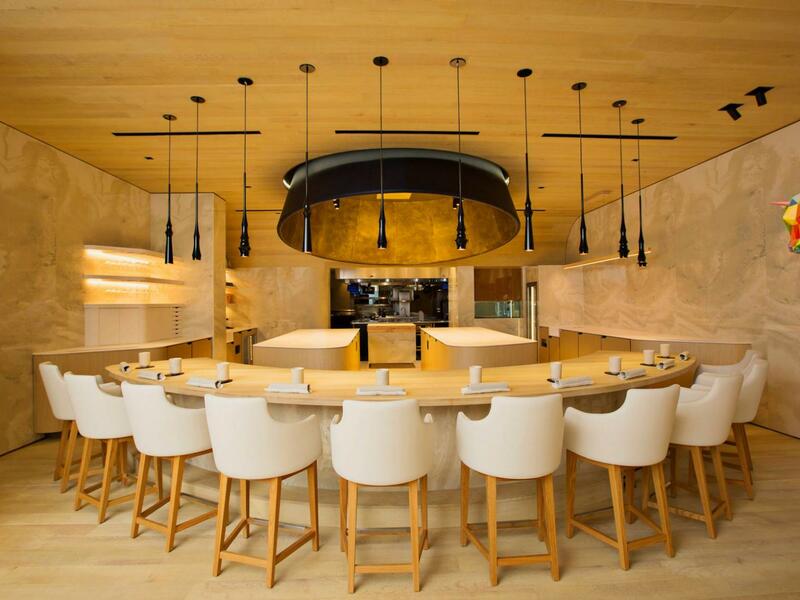 The 12-seat Chef’s Table also does not disappoint with its 13 courses and wine pairings. Foraging rules the menu at Yarraville’s Navi, where chef Julian Hills experiments with his bounty across 5- or 8-course menus. Matched beverage options are always available, with a special focus on Australia’s best. Group Dining: The chef’s bar seats up to four guests and makes for a fun, interactive dining experience if you’re traveling with a small group. Otherwise, the restaurant only seats 25 guests in total, so you’ll want to book far in advance if you’re planning a gathering for a special occasion. 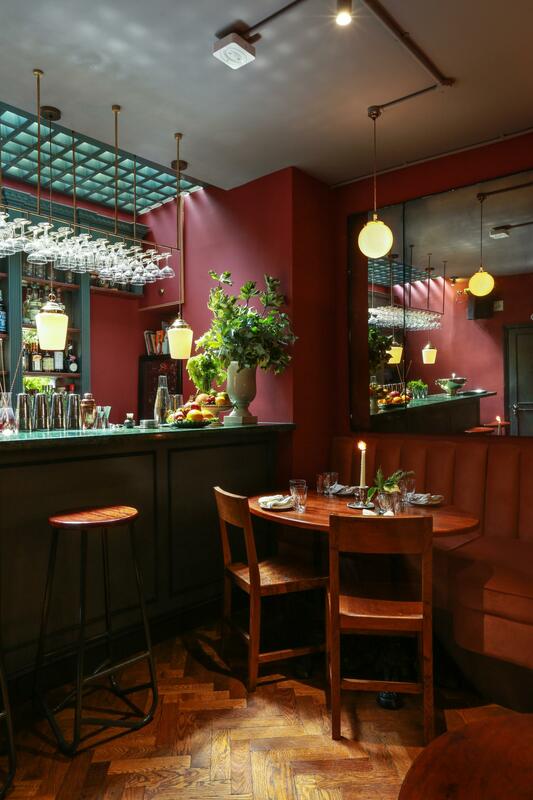 Brought to London by the team behind Kitty Fisher’s, Cora Pearl offers comfort food and great cocktails in an old Covent Garden townhouse. The interiors feel appropriately vintage and the comfort level is supreme. Group Dining: The restaurant spans over two small dining spaces on separate levels. We’d recommend booking upstairs if you’re traveling with a group. 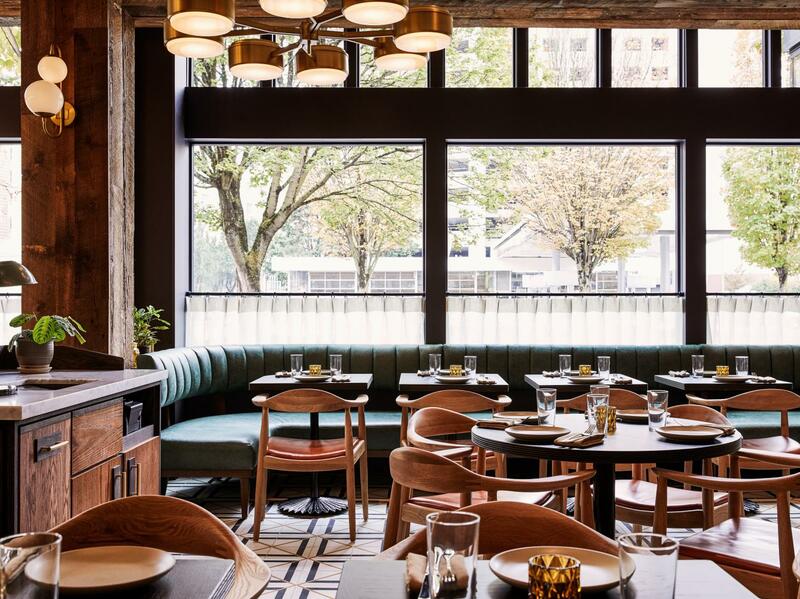 La Neta’s Mexican-inspired brunch, lunch and dinner menus have what they call an “aggressively seasonal” PNW approach. 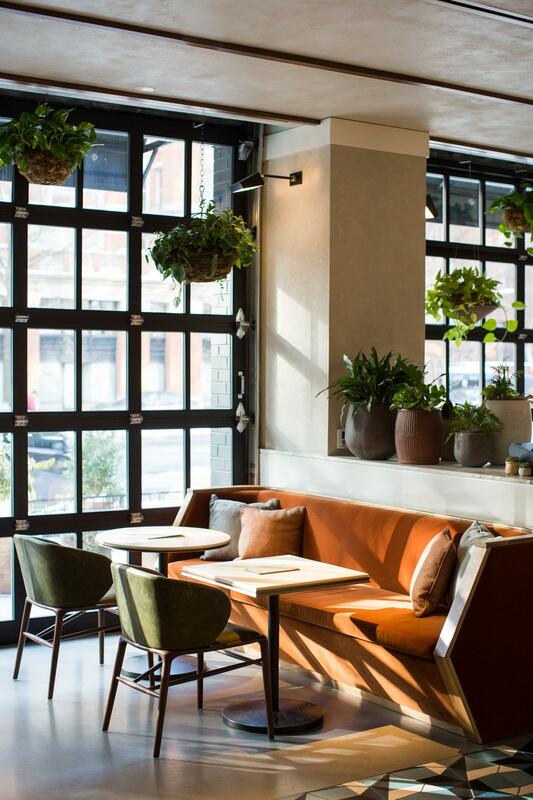 The space is a beauty with lots of natural light and cozy green leather banquette seating. 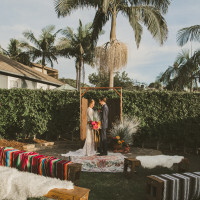 Group Dining: For groups of less than 20, we’d say you’ll want to book into one of those wrap-around banquettes that’ll hug your crew together like a good ole diner booth would. 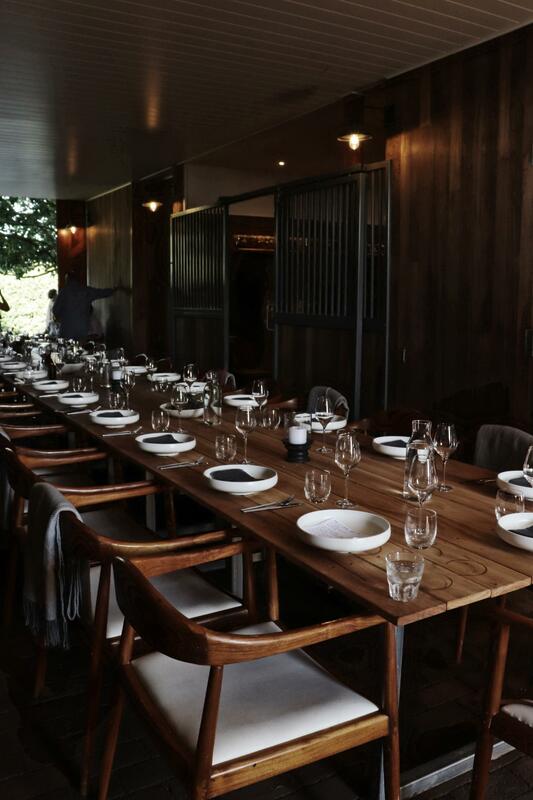 Rural Kangaloon sets the wild Australian scene for this 70-seat farmhouse pop-up dinner spot. 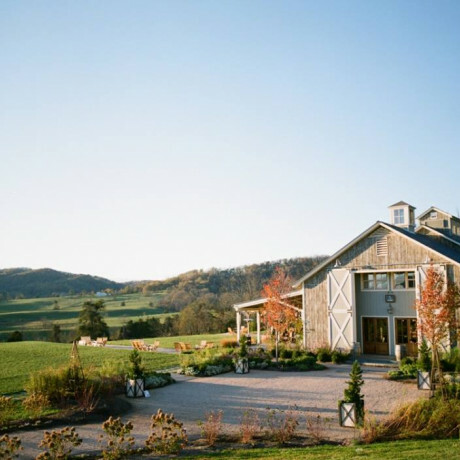 At Barn by Biota, dinner’s served two Fridays a month with a set menu that includes food and booze. Group Dining: This is the perfect group outing for a double date or a get together with a group of four close friends. 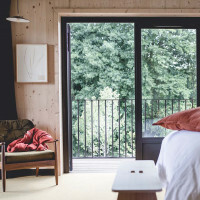 There’s a barn loft with two bedrooms that’s available for two-night stays so you can turn it into a weekend getaway. 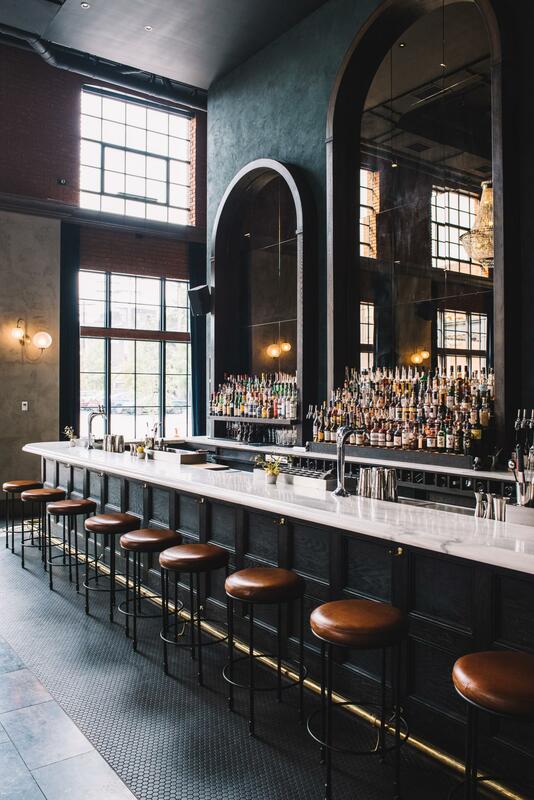 From the creative minds behind Union/Pine, comes a brand spanking new venue in Portland called West. 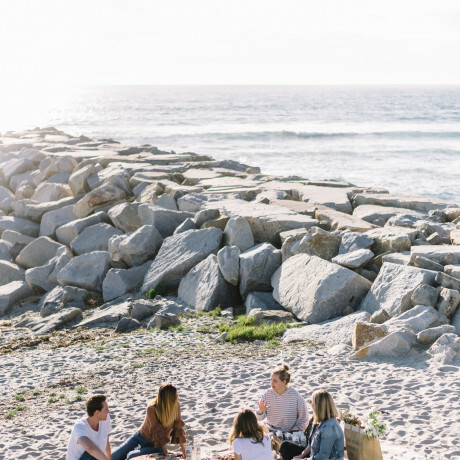 Open as of February 2019, West has the advantage of being a "second child," meaning the team is high on the learning curve: fine-tuned features, useful perks, thoughtful design and beautiful in-house rentals have all been taken care of. Their goal is "to create a space that is as warm and welcoming as our first venue, but with the added bonus of being a neighborhood bar as well." Yep, West is also fronted by a bar with a full menu. 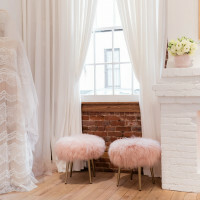 Good for: grabbing drinks with friends, intimate weddings year round, and discerning corporate events that stay away from all things "basic." 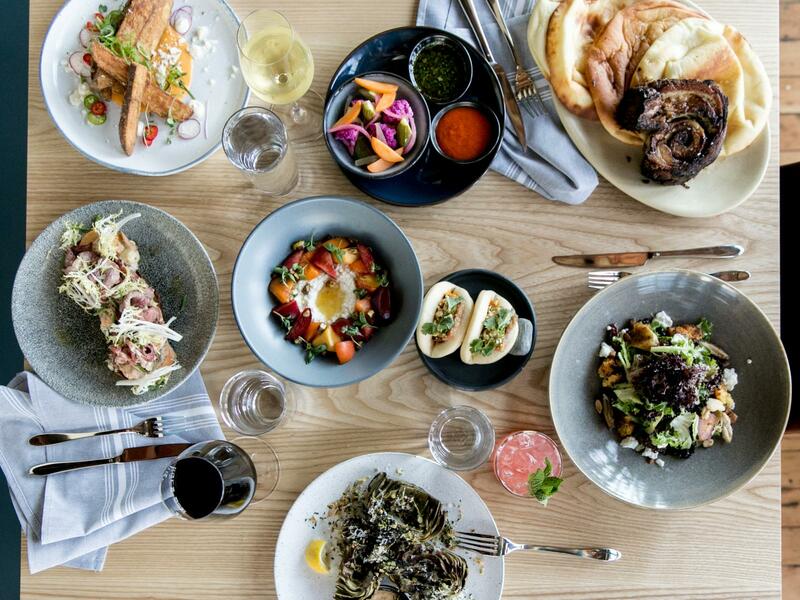 Beautiful food served in a beautiful setting with scenic lakeside views is the name of the game at Kristen Kish’s Arlo Grey. 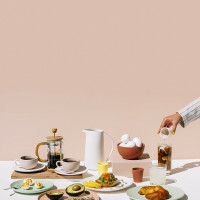 The Top Chef 10 winner blends French and Italian techniques with local Texan ingredients to create beautifully crafted dishes for breakfast, weekend brunch and dinner. Group Dining: Groups of six will be sittin’ cozy in plush patterned chairs set around marble topped tables. Looking for something bigger, like a 10-top? There’s a big round table that works for that too. Michelin award-winning chef Simon Rogan of Roganic London is at the helm of this 12-seat chef’s table in Hong Kong. Rogan’s contemporary British style of cooking is chef-presented and paired with the sommelier’s wine recommendations for the ultimate food experience. 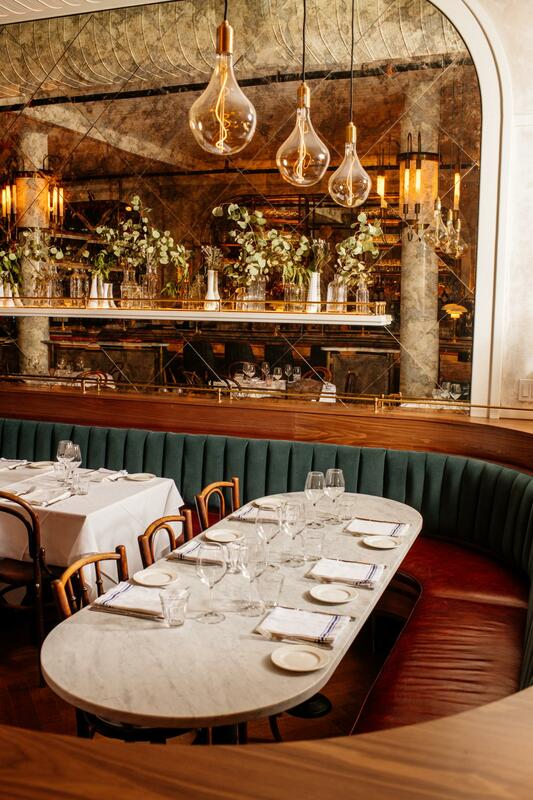 Group Dining: The 12 seats can be reserved individually or purchased as a private room for a celebratory event. 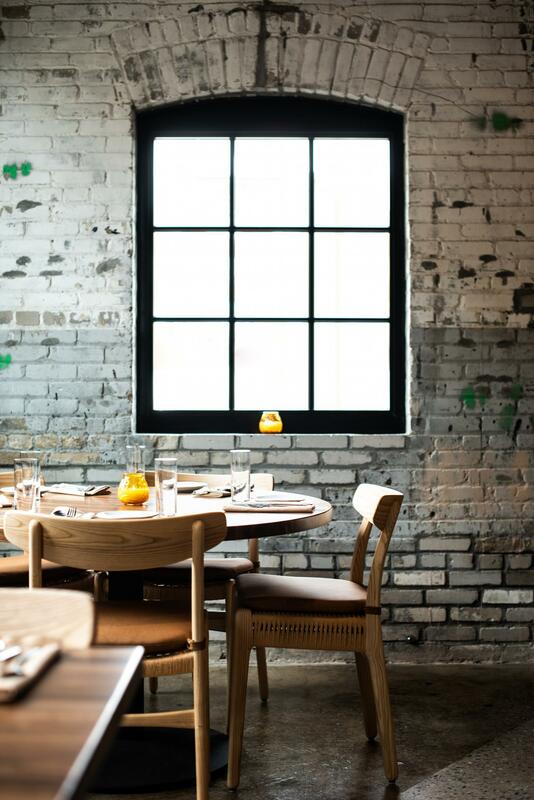 Wood-fired cooking and an elevated, contemporary approach to Mexican cuisine drive the menus at Popol Vuh in Minneapolis. 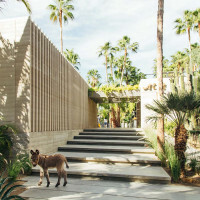 Expect the cocktails to follow suit with an emphasis on mezcals and tequilas. Group Dining: The 40-seat restaurant is relaxed and comfortable for groups of about six diners. Any more than that and you’ll want to call ahead to discuss your dining options. 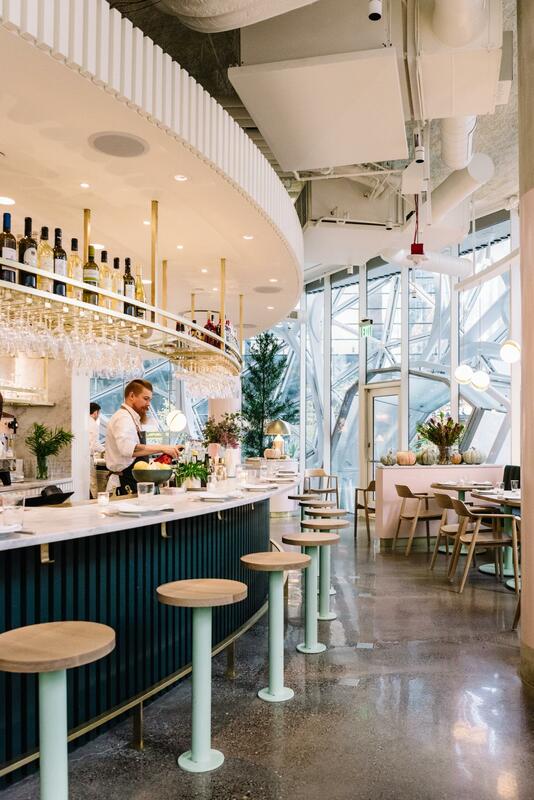 Set inside the Amazon Spheres, Willmott’s Ghost serves up pizzas, veggies, meats and more. Open for lunch and dinner, there’s a total of 45 seats here. Group Dining: Since Willmott’s Ghost is on the smaller side, a buyout will be your best bet for privacy. Groups of about six will be cozy at the round booth tables. Beckon is an 18-seat chef’s counter restaurant located in the heart of Denver’s RiNo district. 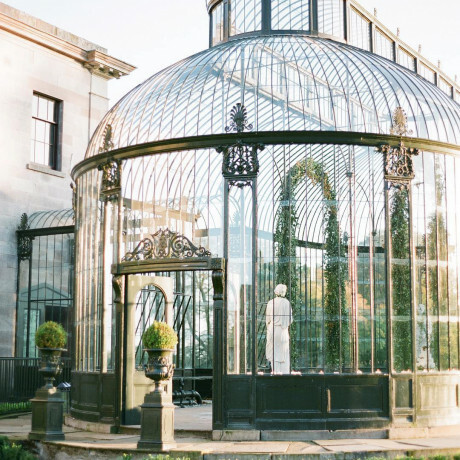 Expect a lengthy, extravagant meal here with multiple courses paired with wines. If you’re traveling with a smaller group, tickets can be purchased on the first day of every month. Group Dining: For a fully customized menu and fully private event, go for the buyout. 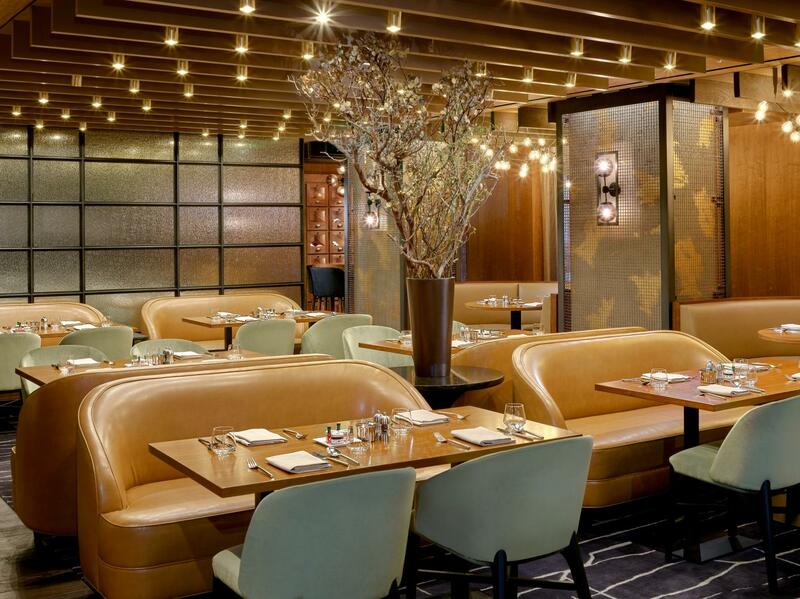 Yet another stunner of a restaurant from Danny Meyer’s group, Manhatta serves seasonal, soulful food with a whole lot of Burgundy on the wine list. 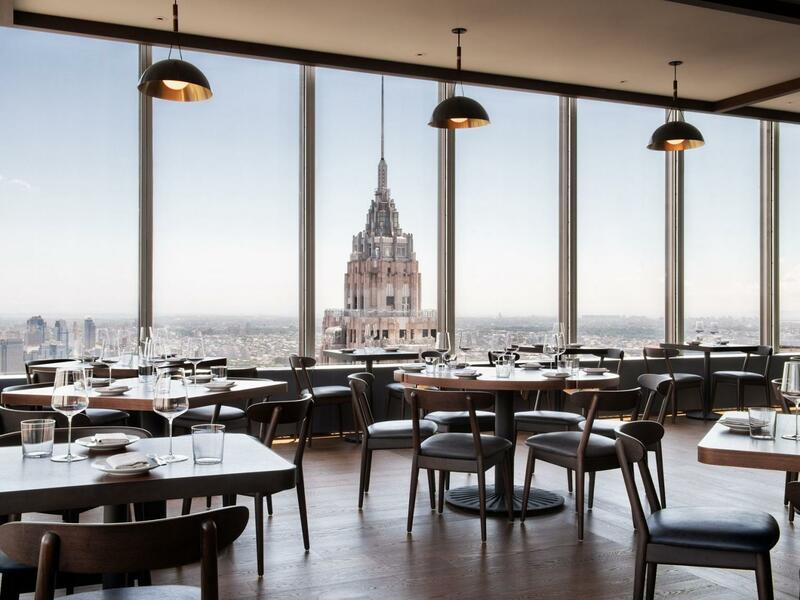 As for ambience, the floor-to-ceiling windows on the 60th story of the 28 Liberty Building allow the NYC skyline to steal the show from an otherwise stark, contemporary space. Group Dining: There’s a private dining room at Manhatta that seats up to 50 guests (or 65 standing) and looks out to Lower Manhattan, Brooklyn and the surrounding bridges, buildings and waterways. 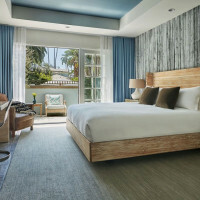 Imagine you had the fanciest Southern grandmother whose affinity for bourbon and comfort food was her best-kept secret. 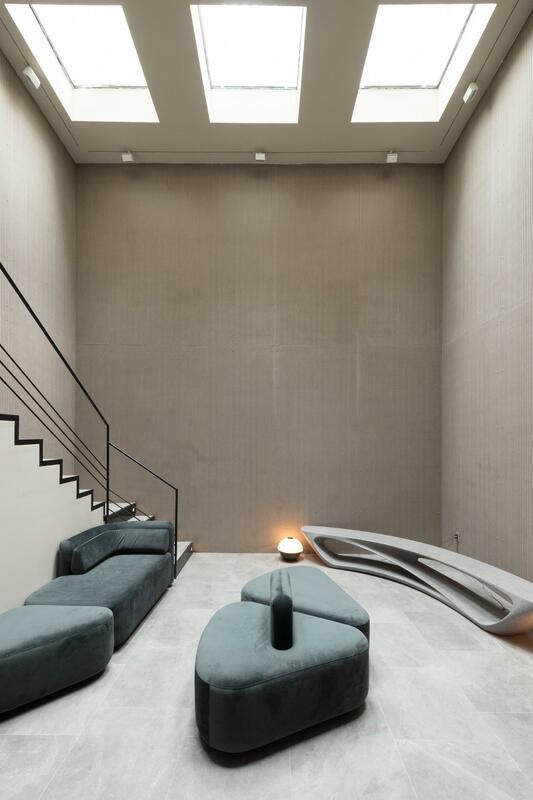 Then imagine she had a special lounge room for entertaining in her home. Abigail Hall is the epitome of that kind of place. Go for the ambience, but stay because the cocktails are so damn good and the Whataburger-inspired (and improved) burgers are legit. 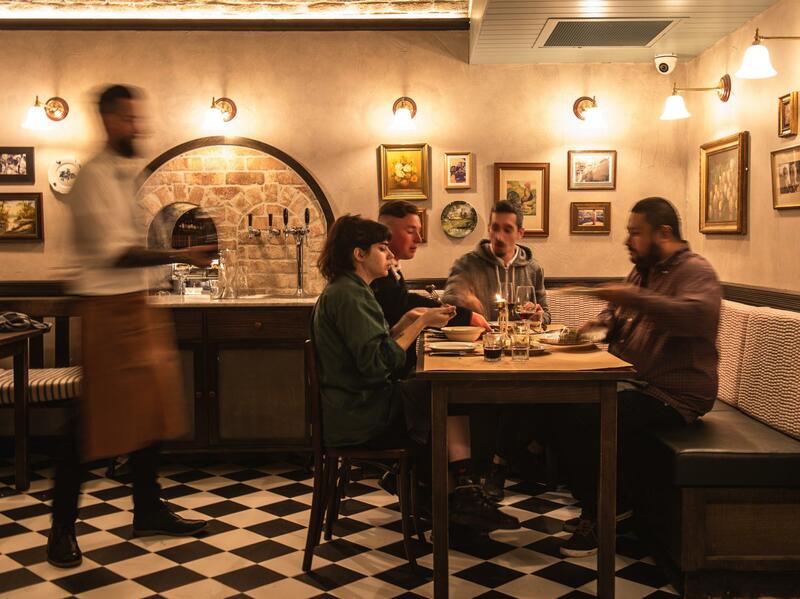 Group Dining: Abigail Hall is an easy place to hang with friends at any given time, but if you’re after private dining, you can book out the whole 35-seat space if you plan ahead. A predominantly Korean restaurant with the occasional Italian touch thrown in, Passerotto brings small, medium and large plates that are easy to share to Andersonville. The cozy, comfortable neighborhood restaurant aims to make eating out a fun affair (mission: achieved). 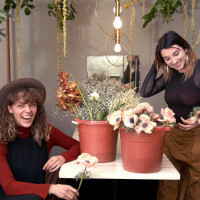 Group Dining: Have a look at Passerotto’s community centric events, as they’re known to host pop-ups and special dinners for special occasions. As far as group dining goes, you’ll want to chat with the events team if you plan to head over with six or more party people. 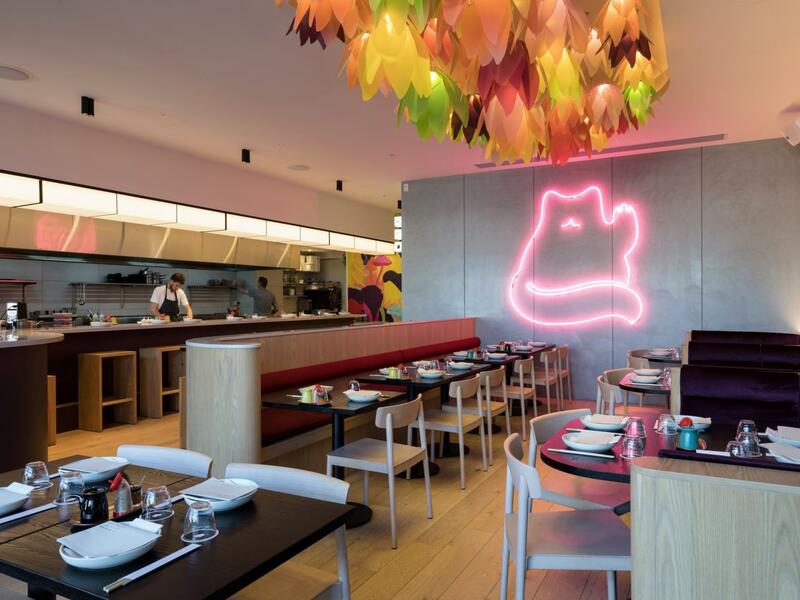 The fare at Hello Beasty ranges across Japanese, Korean and Chinese influences, dipping into everything from potstickers and buns to Hibachi and chef’s tasting menus. 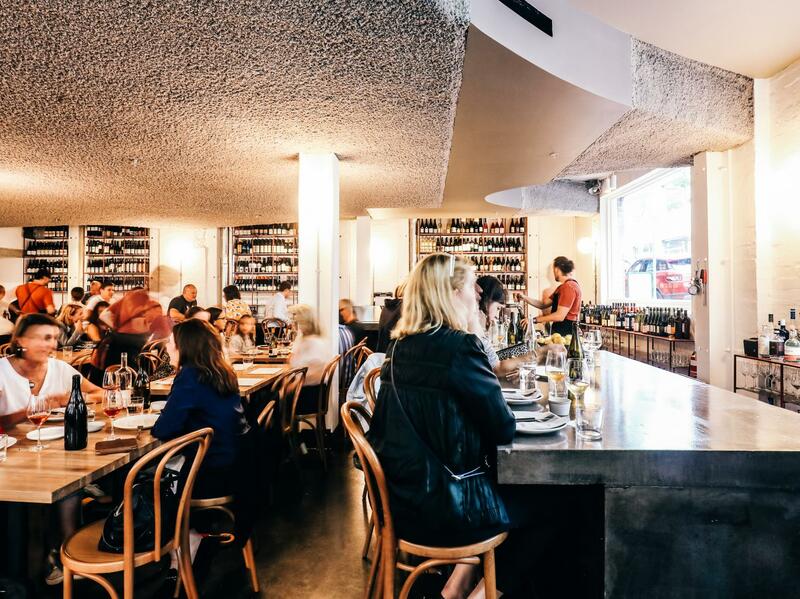 Located on Auckland’s waterfront, this spot delivers not only delicious food but an inspired space that’s anything but stock-standard. Group Dining: The menus are designed to share, so go ahead and bring your friends along for the experience. There’s a table that can seat at least 20 guests, though you can book events for more or less folks. Formerly NYC-based chef Nick Curtin (Rosette, Almanak, Spuntino) is the brains behind this new Americana style restaurant in Copenhagen. The menu changes daily, with five courses set by the chef and wine pairings available. Set in a converted pencil factory, the space seamlessly blends old and new. 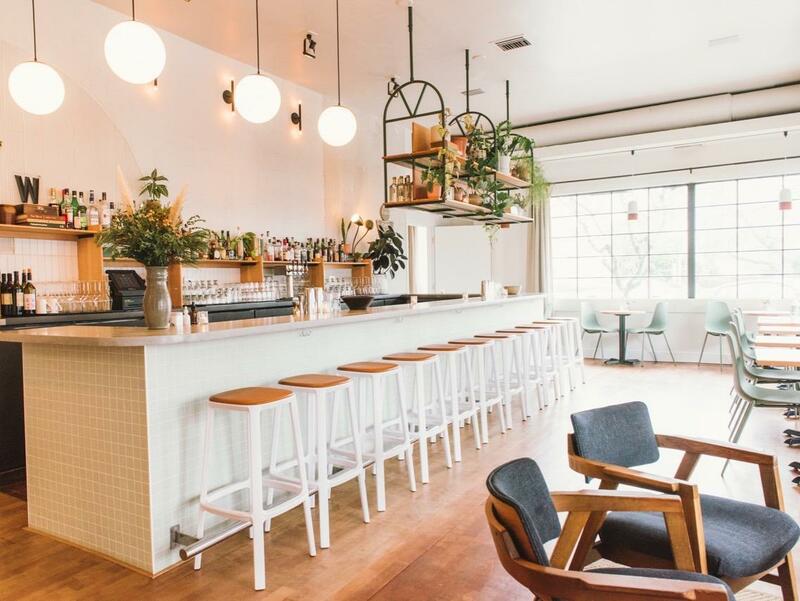 Group Dining: The 50-seat restaurant typically operates Thursday-Saturday, but you can book a private event on any of the off-days if you’d like exclusive use of the space. Otherwise, groups of 6+ should book in advance. A throwback to old school Italian supper clubs, Melfi’s has an atmosphere that’ll quickly make you forget what year, or even what day it is. The space is complemented by a classic menu of handmade pastas, salads, larger Italian dishes and “Roman-ish” thin-crust pizzas. 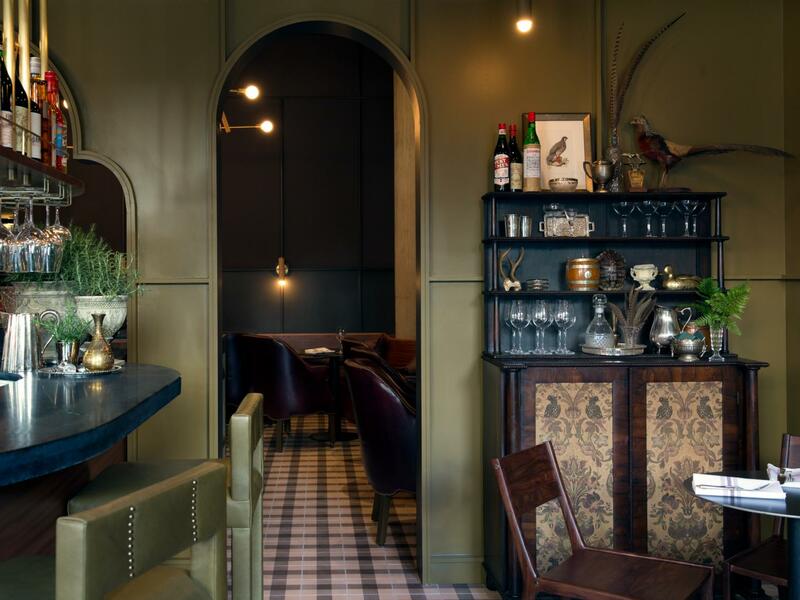 Group Dining: The restaurant is small, with green leather banquettes lining the walls, bistro tables down the middle of the space and a couple of counters for eating and drinking. As such, any group larger than four diners will want to call ahead to reserve one of the banquettes. Applewood roasted Peking duck, beautifully crafted dumplings and Alaskan King Crab casserole with crab roe and vermicelli are just a few of the highlights on the menu at this Chinese restaurant inside The Venetian. 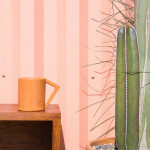 Inspired NYC’s bustling, industrial Chinatown, the space is one that wows in that wonderfully Vegas way. Group Dining: Mott 32 is an easy go-to for group dinners, especially if you want to be in the middle of the action with your group. 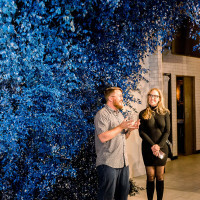 Restaurant American Son at Eaton DC wants to be known as the liberal hub in Washington, a place where progressives can meet up to discuss social change or simply have a delicious meal in a decidedly political place. All-day dining that runs late into the night focuses as much on comfort food and the chef’s second-generation roots as on its own rooftop-grown vegetables and relationships with top local purveyors with best practices. Group Dining: The hotel has various event spaces and meeting rooms, but the restaurant’s great for something more casual. 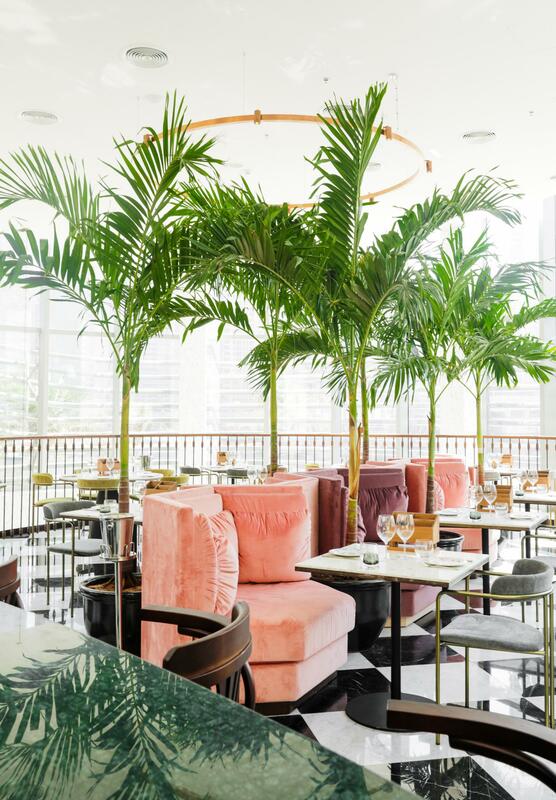 A colorful, tropical restaurant in Dubai’s downtown just across from the Opera, Kizmet spans across two floors but is still small by Dubai standards. The 75-seat restaurant offers a menu filled with soulful foods that are easy to share while you sip on playful, sweet cocktail concoctions. Group Dining: The space can be adapted and rearranged easily for product launches, workshops, business meetings, photo shoots, private events and more. Chef Matt Manning makes a point of working with only the best local producers and purveyors to punch out delicious courses at his restaurant Grub & Vine. The comfortable space serves lunch, dinner and Saturday brunch. We’d recommend going for dinner and opting into the 4-course menu with wine pairings for the most indulgent experience. 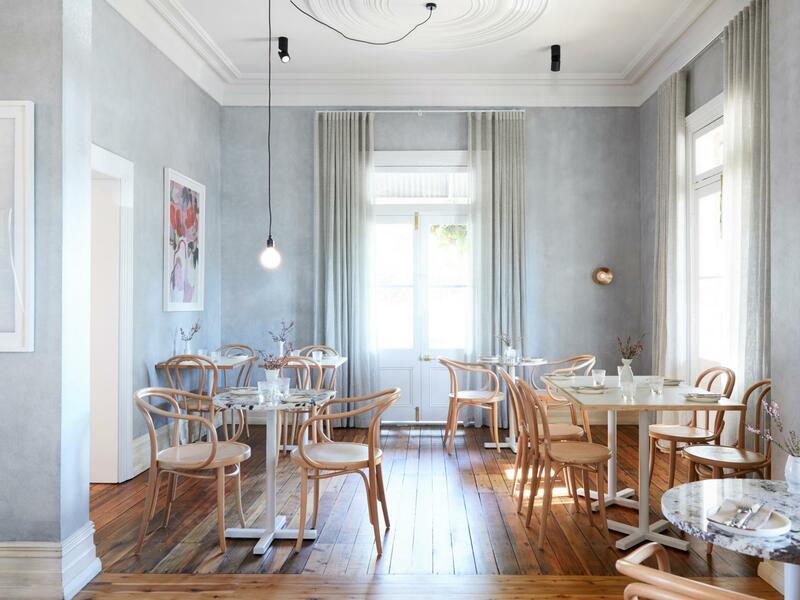 Group Dining: Grub & Vine might just be one of the best new places to host a small private dinner in Cape Town. The restaurant’s private dining room comes complete with a 16-seat table, a private bar and exclusive access to a courtyard. It can be booked for lunch or dinner. 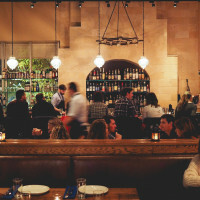 French wines, Provençal-inspired food and a dining space with a hearth at its center give Tin Tin a French atmosphere even though it’s located in the heart of Atlanta’s Westside. 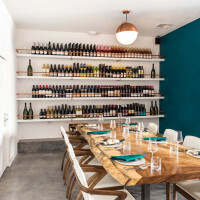 Set alongside Aix restaurant, this small wine bar has 10 seats at the bar and another 10 at bistro tables, while the uncovered patio seats about 23. Group Dining: You’d want to either do a buyout of the whole place or book out the patio if you’re planning a party. For something more casual, stopping in with a group of about five or six is comfortable. The secret cocktail and champagne bar that sits under sister restaurant Cote, (aptly named) Undercote is great for grabbing a quick drink with friends or hanging out for an hours-long gab session. 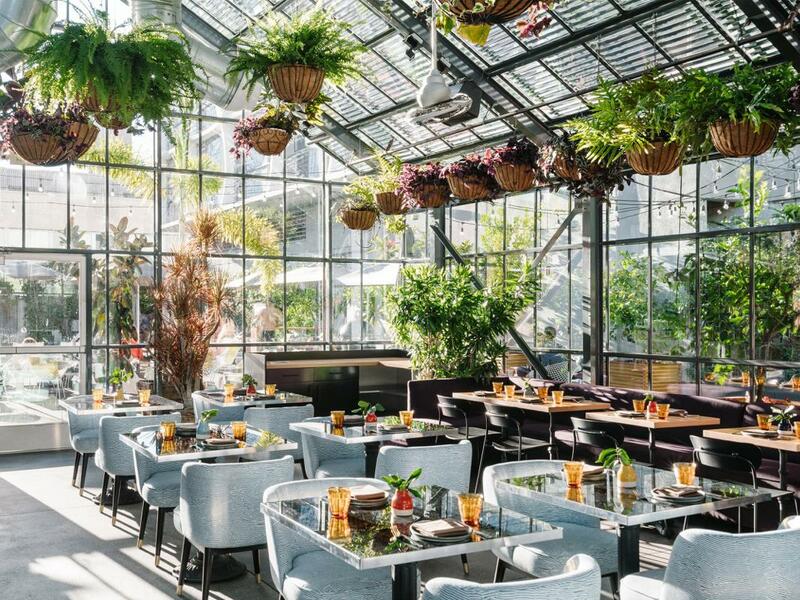 Expect interesting wine selections and inspired cocktails in a moody, plant-rich setting. Group Dining: For private events, you’ll want to book out the whole space. 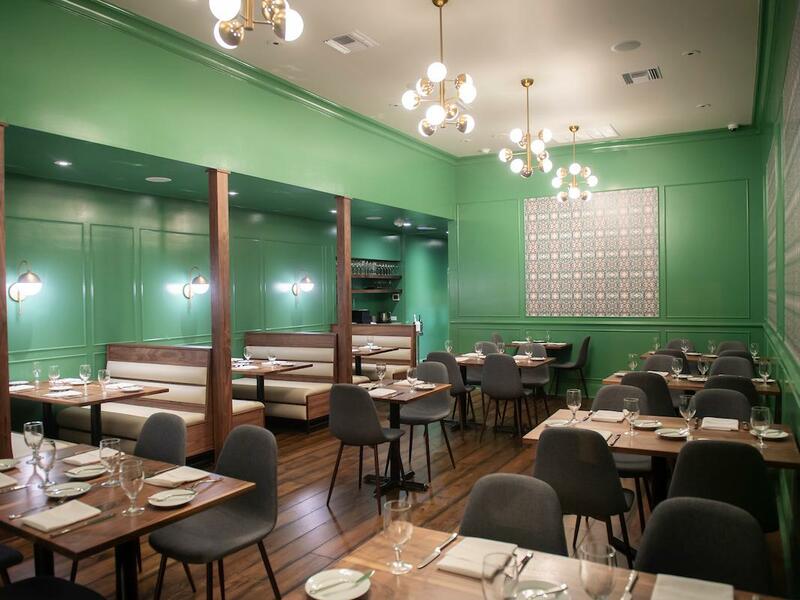 Hearty, rustic and approachable food lines the menus at The Bear & Monarch in SF. As for the decor, expect honey leather banquettes and plush blue velvet seats set around big, comfortable tables in a glowy, golden space. Group Dining: There’s a private dining space here that seats up to 30 guests. 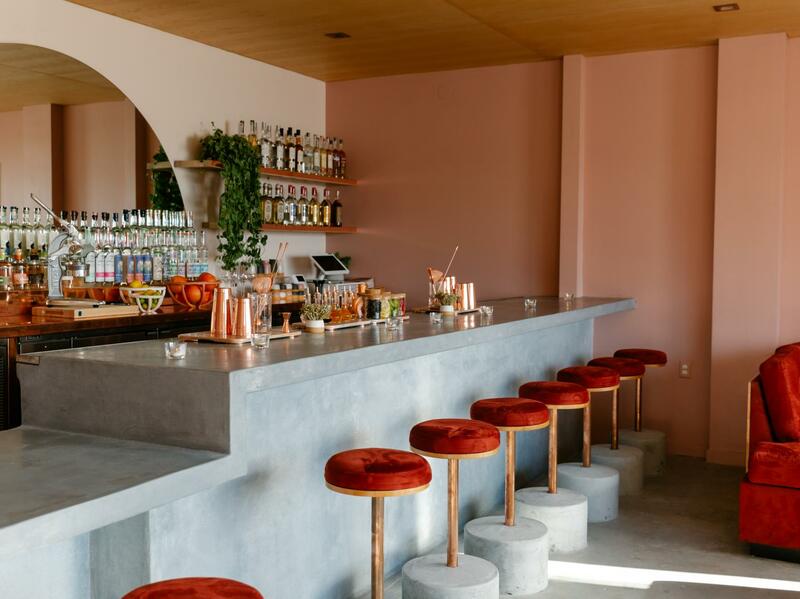 A minimalist, modern space in Byron Bay is serving small plates with a blend of Mexican, Costa Rican and Peruvian influences alongside an impressive, playful cocktail menu. The team behind Locura’s food is that of Three Blue Ducks, while Tim Phillips (Deadringer, Bulletin Place) is on the drinks. Group Dining: This solid team is happy to put together an event booking for you, adapting their food to the occasion with lots of grazing and shareable options. Hello, Peaches! 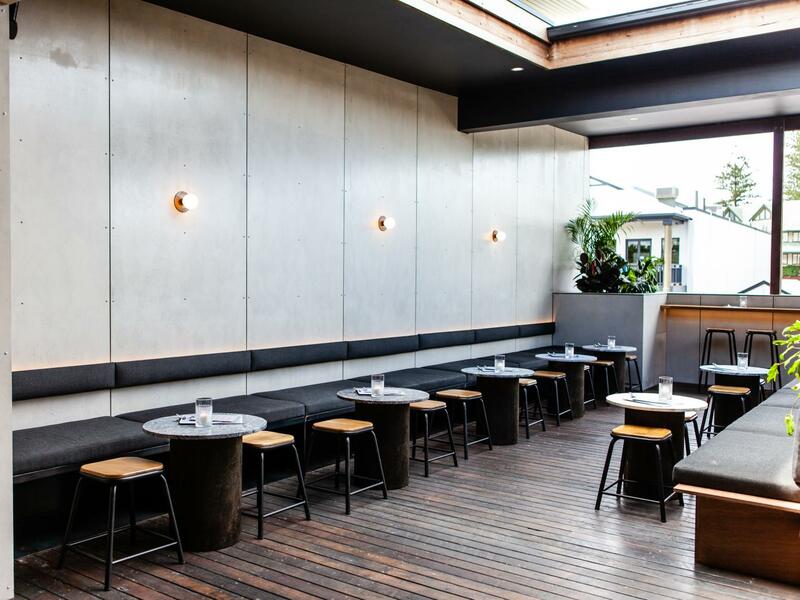 The latest rooftop to open in Melbourne is a two-story indoor-outdoor pretty-in-peach space on Swanston Street that’s open as late as 3am on the weekends. It’s the place you go to for drinks, but end up ordering food if you hang around long enough. Group Dining: The lower level of Peaches is where you want to bring your party people if you’re in it for playful, experimental cocktails. 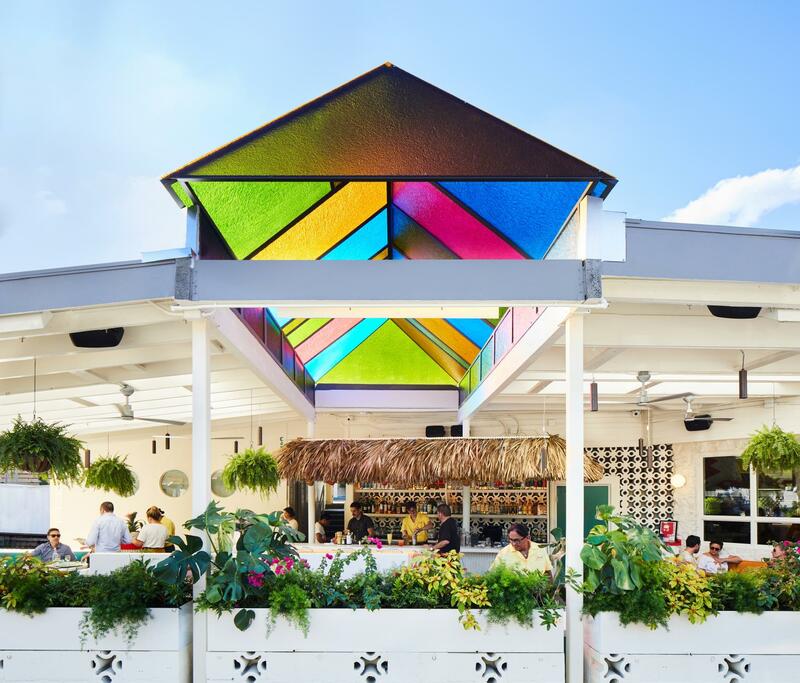 Otherwise, that rooftop is perfection for a sunset tipple with your after-work crowd. 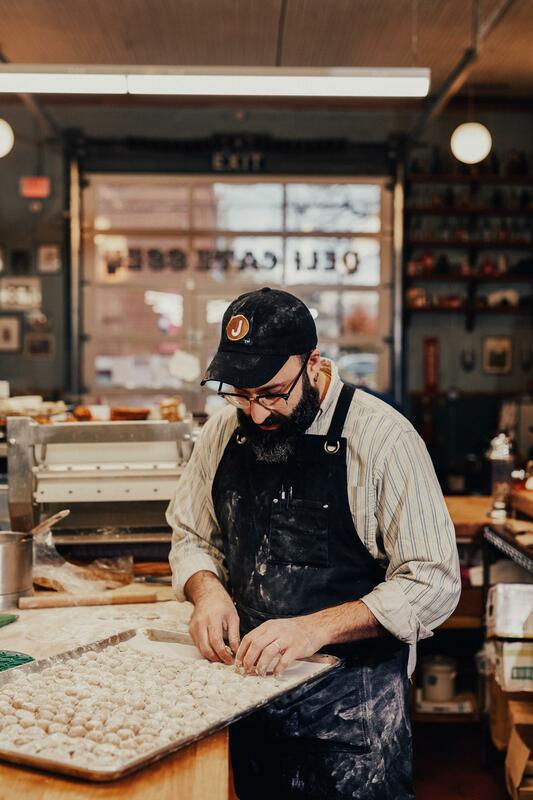 Set inside the Ohio City Firehouse in Hingetown, this Cleveland Larder Deli and Bakery is delivering goods that span from pastrami sandwiches and classic deli sides to comforting chocolate babka, all made in-house. 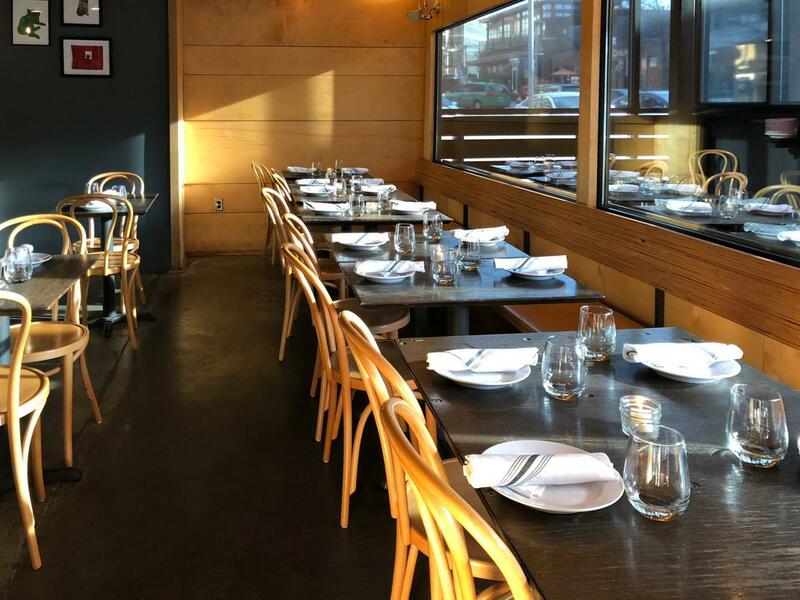 The neighborhood spot is casual and no-frills yet the well-honed approach to comfort eating has landed Larder on the list of James Beard award semifinalists for Best New Restaurant. 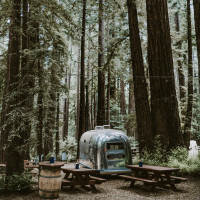 Group Dining: Check out the classes in canning and preserving, charcuterie, fermentation, and foraging if you’re looking for something fun and interactive to do with a group. Private dinners are also an option if that’s more your speed. Every health-conscious comfort food lover’s dream come true, this Toronto shop makes entirely plant-based pizzas and ice creams. And they’re delicious, with a cult following to prove it. We’d recommend the double chocolate and salted caramel ice cream. Group Dining: The booths are comfy if you’re rolling with a small group, but you can also rent out the whole space for private events if you’re thinking party party. 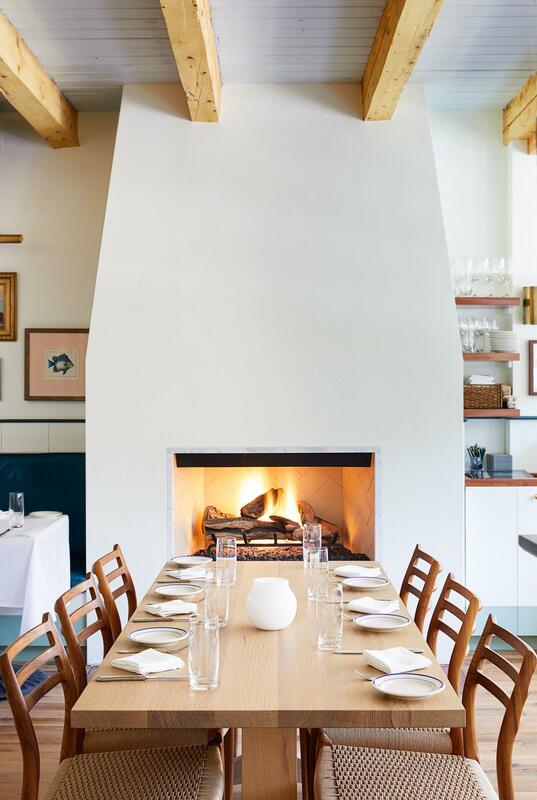 Dinner, brunch and lunch are served with a California feel at this Chicago spot where the food is cooked in a couple of hearth ovens. Pacific Standard Time has easily won the adoration of many a design aficionado, securing that affection by serving equally light, bright food. Group Dining: The private dining room here is modern and airy, with seating for up to 58 guests or cocktail space for up to 100. Best part? This dining room has its own entrance, bar and service staff. 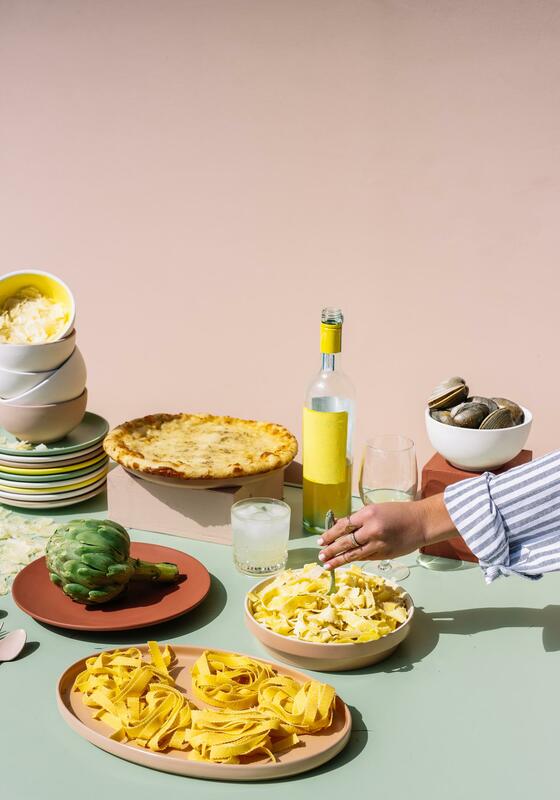 Set at the front of the Park MGM, the new Eataly in Vegas is home to a couple of restaurants, a cafe, three bars, six takeaway counters, and so much more. Like all Eataly outposts, this one is a community hub as much as it is a destination for eating and drinking. 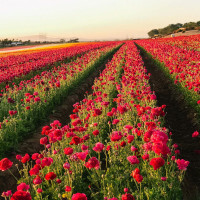 Group Dining: Wine tastings, cooking classes, market tours and winemaker dinners are all fun options with a group. But it’s the chef’s table that’s probably the top highlight for food people. 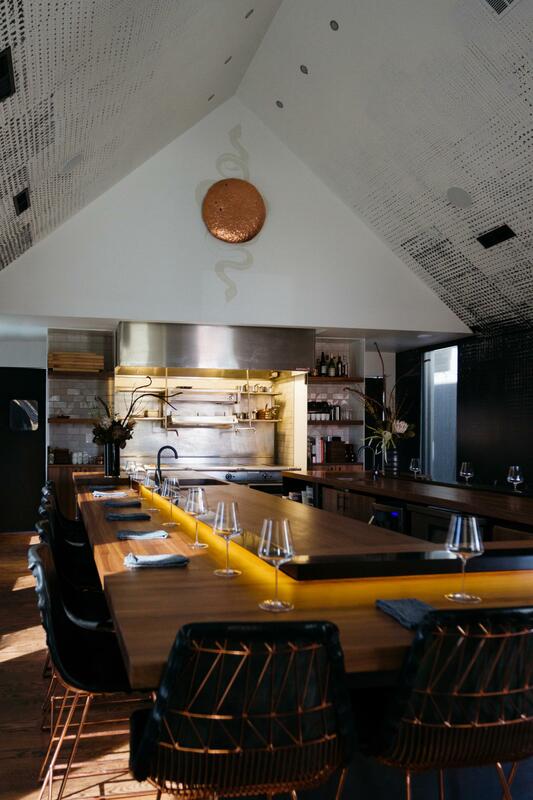 The reservable 11-seat educational counter allows guests to be in on the cooking action, observing the chefs and learning all about their craft. 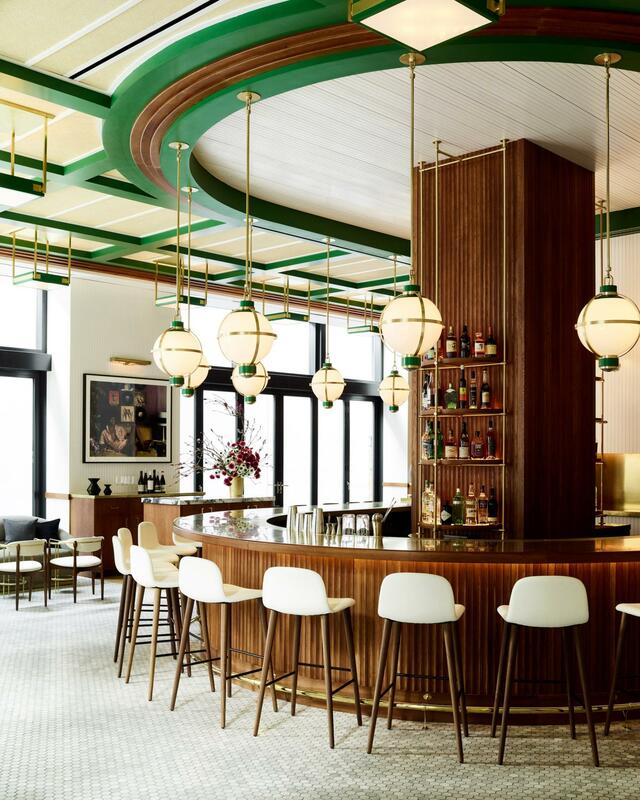 Officina serves as a tribute to Italian food culture, offering an Italian marketplace, cafe, trattoria, rooftop lounge and an Amaro library all located in one three-story building in The Wharf. The spaces within are modern and beautifully designed, giving visitors any number of reasons to take their time exploring. Group Dining: There’s a gorgeous 12-seat private dining space overlooking the street below, which is perfect for a business meeting, birthday party or small engagement celebration. 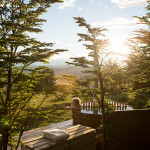 You can also reserve the rooftop for private use, which works well for a group of up to 60 guests. 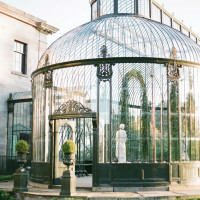 If you’ve got a big party to plan, the entire place can be bought out to accommodate an event of up to 500 guests. 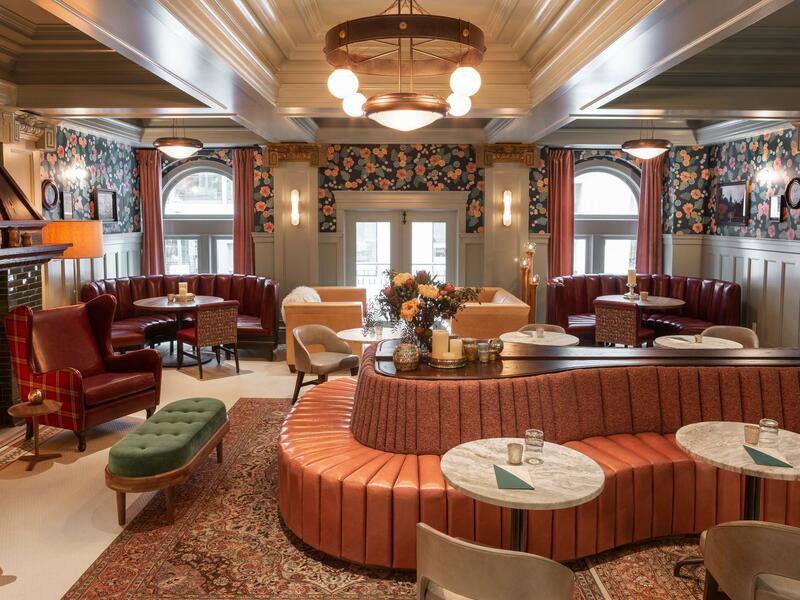 Celebrated Southern magazine, Garden & Gun, expanded its lifestyle brand last year with the opening of its first Atlanta clubhouse (no membership required). 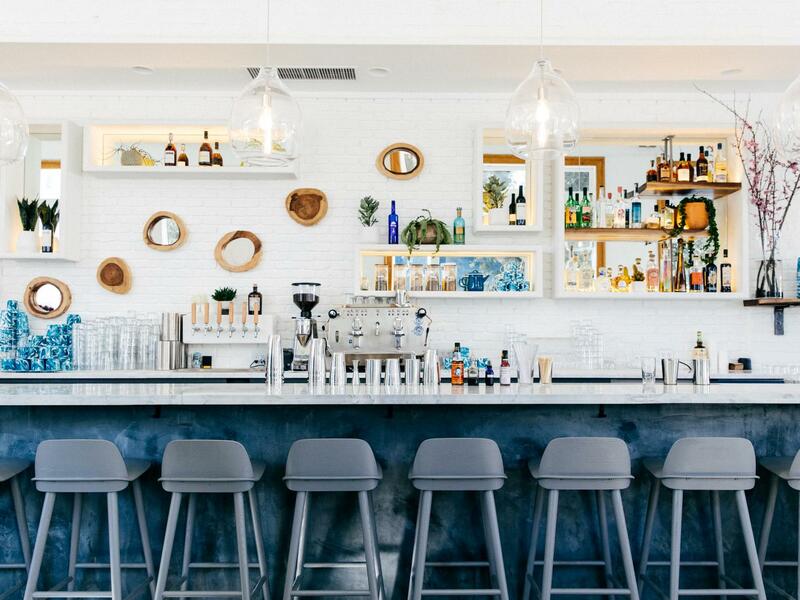 Located at The Battery Atlanta, by the Braves’ new stadium, the space is quintessentially Southern and offers menus that include a raw bar, biscuits for brunch, buttermilk fried chicken and a whole lot of bourbon options. Group Dining: Entertaining is at the heart of the brand, and as such, the private dining spaces at this spot do not disappoint. Family-style sharing is encouraged at Sawyer, an Americana restaurant set inside an old 1920s sawmill in Seattle’s Ballard neighborhood. 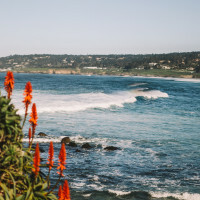 The dishes here reflect their West Coast landscape, ranging from Dungeness crab rolls to wood-grilled artichokes and udon noodles with house pastrami and bay shrimp. The beautiful, light-filled space at Sawyer will make you want to stick around for dessert and try the choco tacos too. Group Dining: The space at Sawyer is spread out to include a main dining room, full bar and a patio that’s open year-round. The patio is usually the best spot to book a private party, corporate dinner, anniversary celebration or rehearsal dinner. Perfectly crusty wood-fired pizzas, beautifully crafted vegetable dishes, and seafood and meat options line the menus at Nashville’s Folk. But for chef-owner Philip Krajeck (Rolf & Daughters), it’s really all about the pizza. Considering the 96-seat restaurant has made it to semifinalist status on the James Beard award nominations for Best New Restaurant list, we’d say he’s onto something. Group Dining: Semi-private dining is available for groups of up to 24 guests in a charming, wooded space. 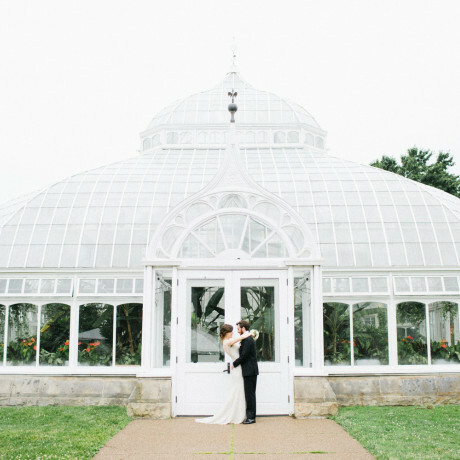 Buyouts are an option for parties of 80+, perfect for a rehearsal dinner, corporate gathering or other celebratory occasion whether social or business related. 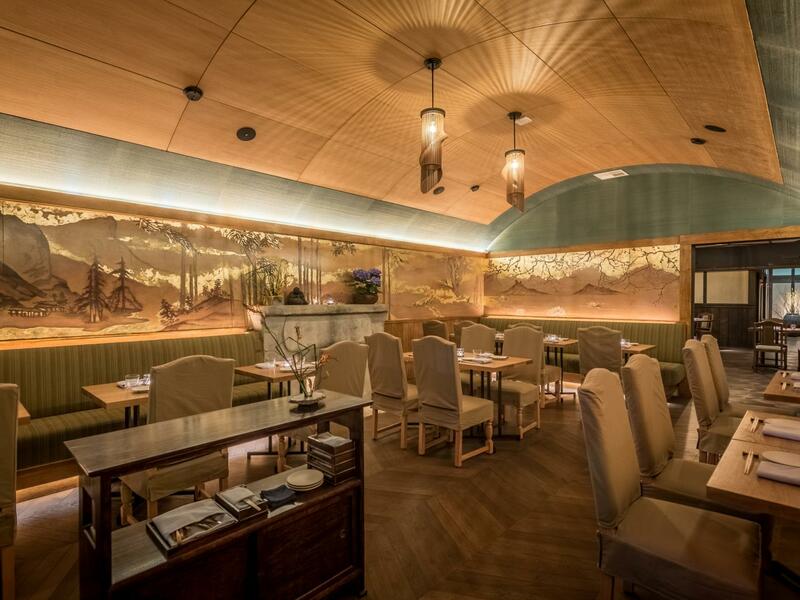 New York’s Michelin-starred restaurant Marea now has a Dubai outpost in the works. 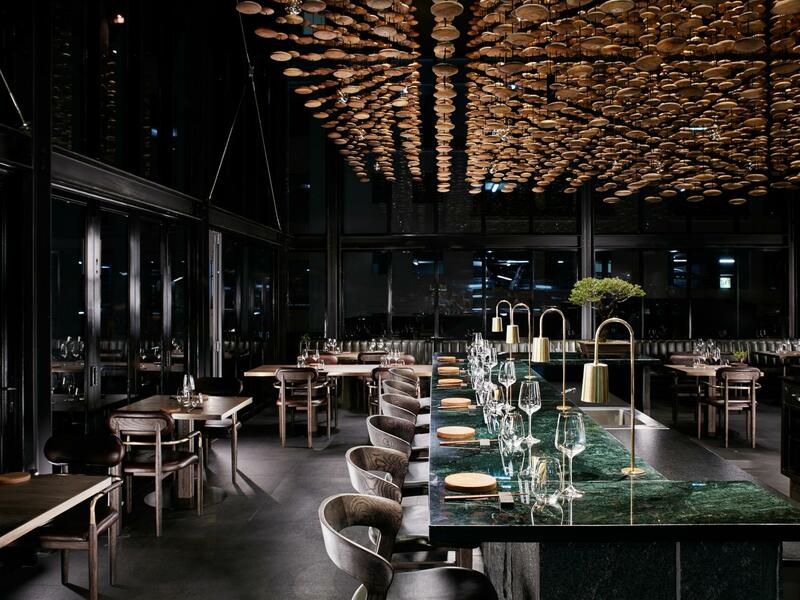 Set to open this year, the high-end Italian restaurant will be set inside Dubai International Financial Centre and will blend coastal Italian fare with a NYC-meets-Dubai atmosphere. Group Dining: Details coming soon! 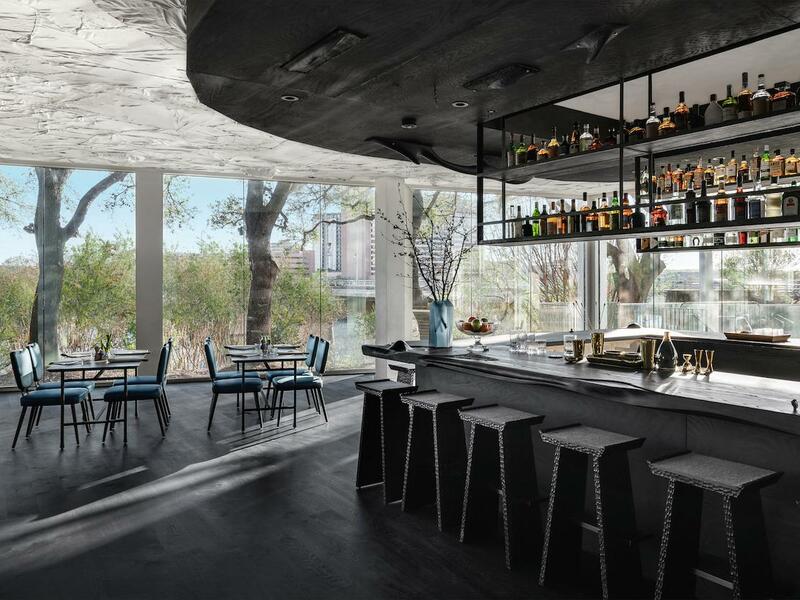 Set to arrive in LA’s Arts District this summer is chef Enrique Olvera’s 15th restaurant. 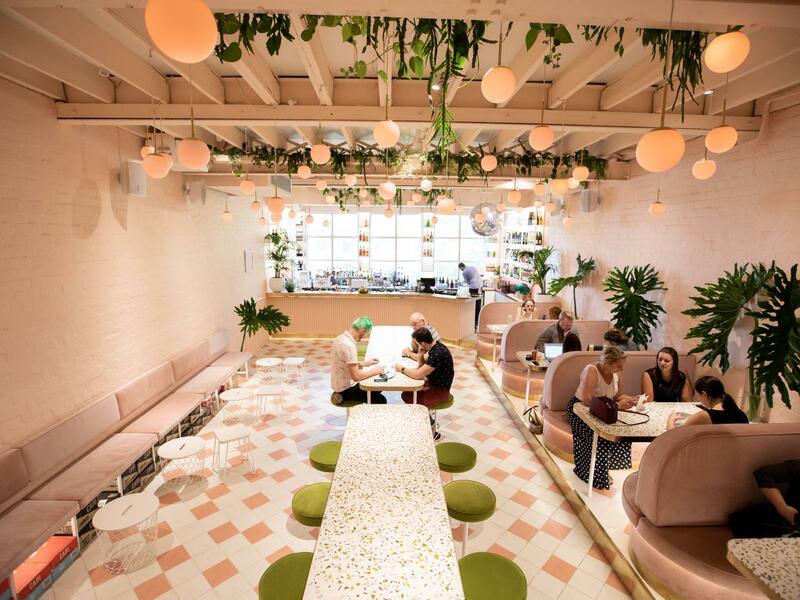 We’re anticipating a menu of light, veggie and seafood centric Mexican eats with slight Korean and Japanese influences, and a space that’s equally bright, modern and stacked with plants. 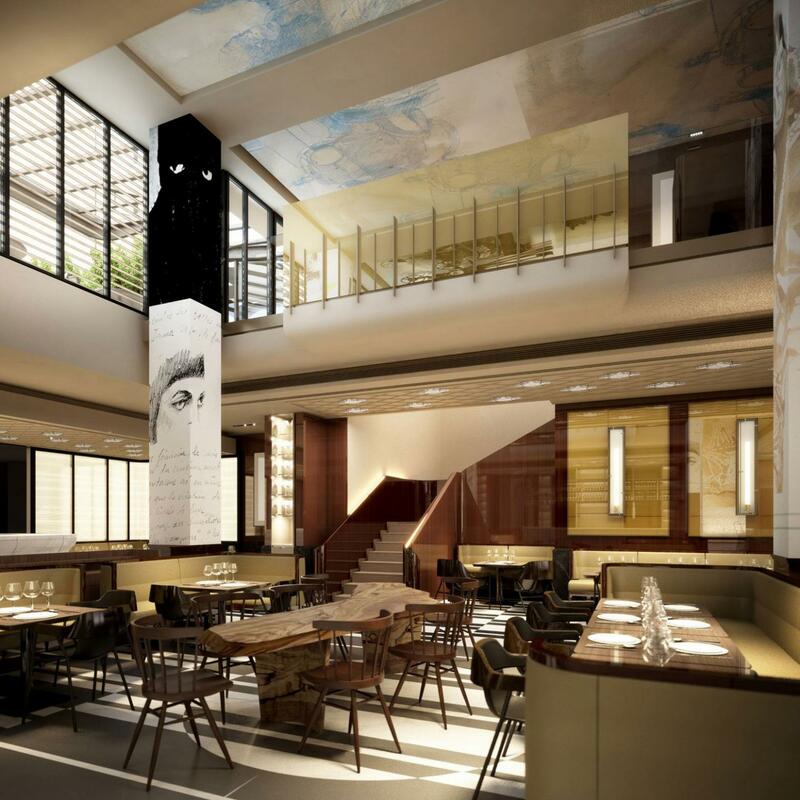 Group Dining: We’ll have to check back in when the space opens, but we know the restaurant will have about 160 seats, so it’s likely a contender for a buyout if you’re planning something big. 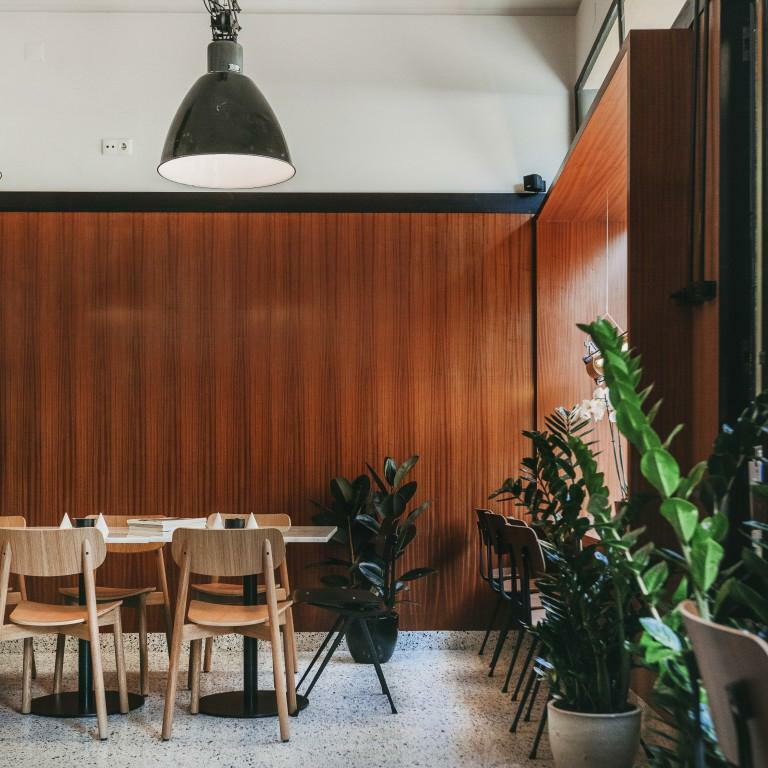 Located in Paramount House Hotel in Surry Hills, Poly is the sister restaurant of Ester, an award-winning restaurant with a reputation for pushing and redefining the boundaries of modern Australian food. 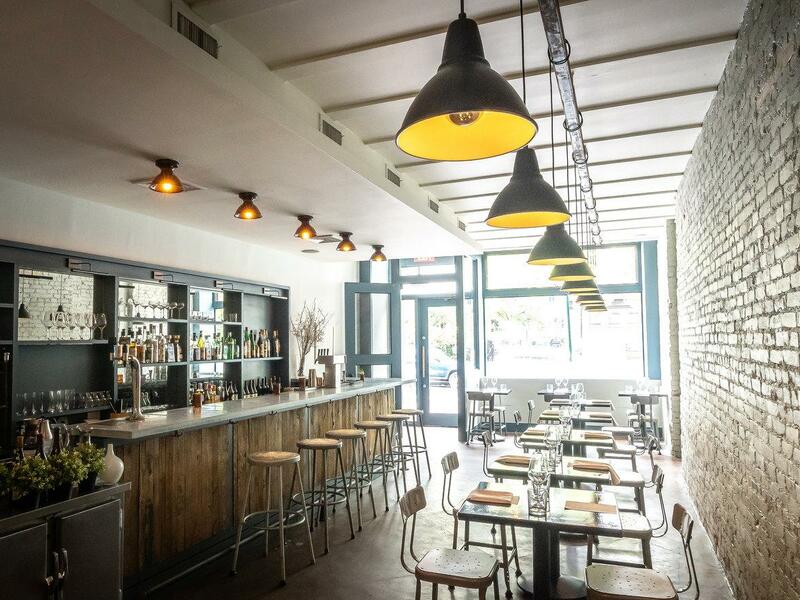 Poly is quickly following suit, though this time with more emphasis on being a wine bar. Group Dining: This spot typically only takes reservations at the beginning of service, between 5:30-7:30. So, if you’re down to dine with a group and want to be sure you have a big communal table ready and waiting, book ahead. Hawaiian home-cooking makes up the menus at Lineage, where local chef Sheldon Simeon dishes up fuss-free, perfectly imperfect plates of garlicky fried noodles, poke bowls, ginger chicken and more. 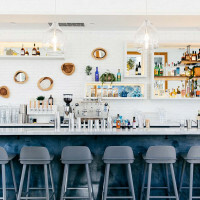 Located inside The Shops at Wailea, Lineage provides tourists a glimpse into authentic fare while giving locals a modern spin on the food they likely grew up eating. Group Dining: Large tables can be joined for a group of 7+ diners within the restaurant space. No private options here, though you may be able to coordinate a buyout if you’re so inclined. 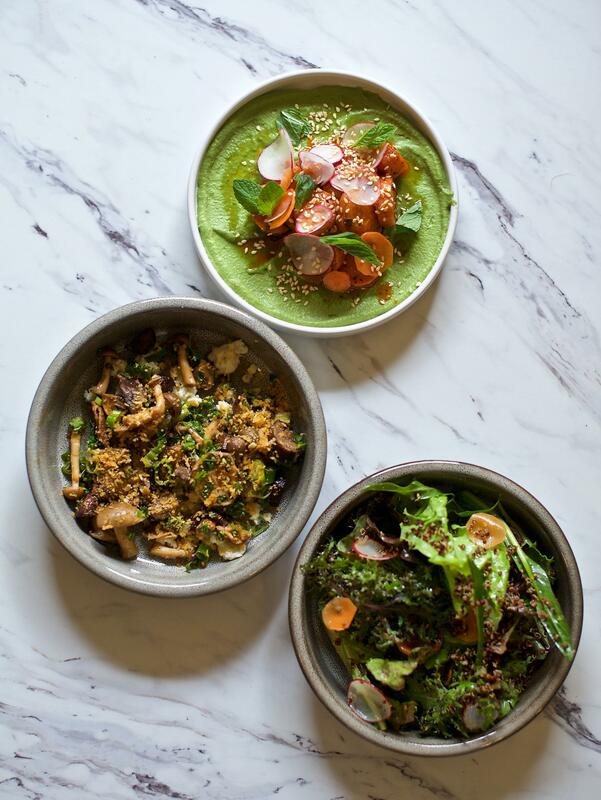 This Carroll Gardens restaurant was founded under the principle that indulgent plant-based fare can appeal to vegans and non-vegans alike. 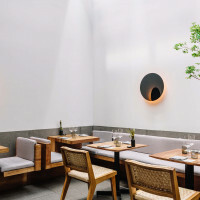 And judging by the rave reviews garnered by the Michelin Guide and various other media outlets, Sans could have serious staying power beyond its one-year pop-up ambition. Group Dining: The restaurant seats only 30 guests, so it’d be a tough space to take over with a huge crew, but reservations can be made for 6-8 people. Head underground in Sydney’s CBD and you’ll find this cocktail bar, steak restaurant and bottle shop. 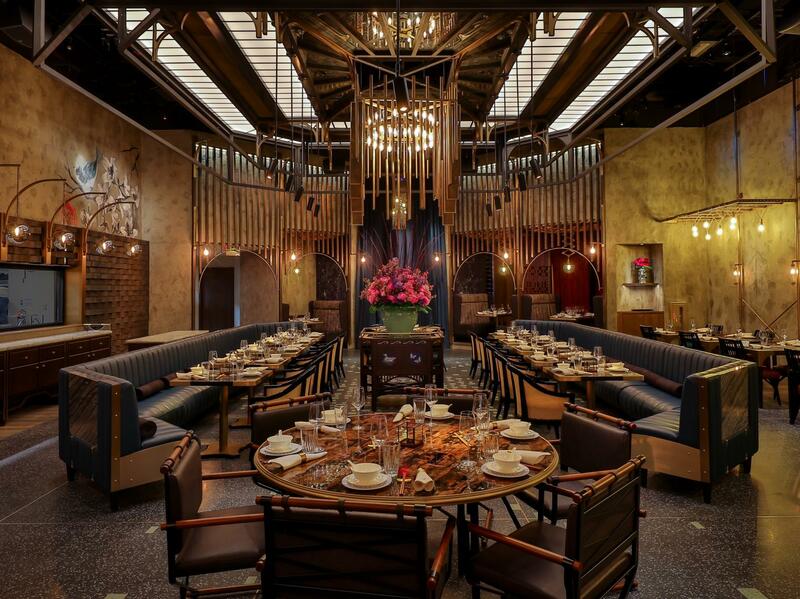 Bistecca’s dining room sits 50 guests in a space that’s defined by its central hearth and domed ceilings. Group Dining: Reservations are accepted for any group of six or more for dinner, with the dining room open to other guests of course. If you’re considering a lunchtime function, groups of up to 40 can be accommodated. The Montreal dining scene is no stranger to brasseries, but this gem inside Hotel Birks stands solidly on its own accord. The space wows with its parquet flooring, beautiful architectural details, glamorous lounge space and elegant, modern feel. The libations are strong and flavorful, and the dining menu does everything right in the way of French comfort food. Group Dining: The brasserie can be exclusively reserved for a group of up to 140 guests and makes a great space for a corporate celebration or event, private party or fundraiser. The lounge can also be booked exclusively for a cocktail event of up to 80 guests. 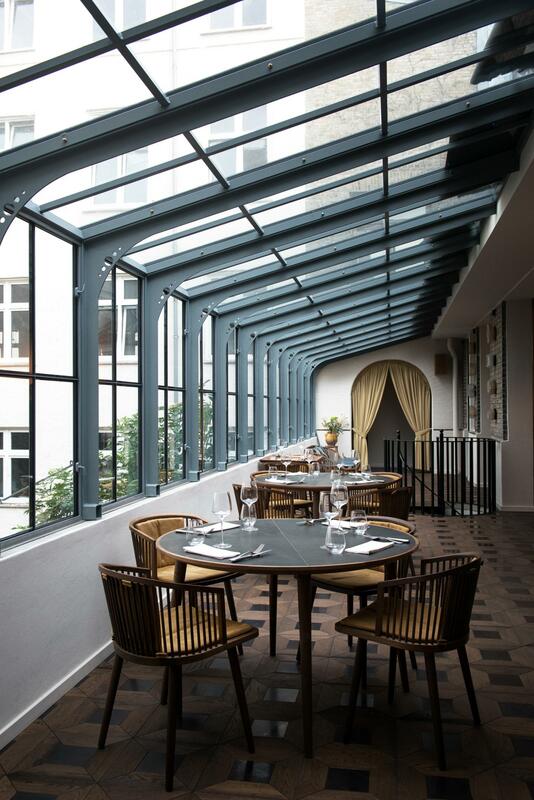 The second floor mezzanine offers a small dining space that overlooks the restaurant, seating up to 36 guests. Lastly, there’s a boardroom if you need maximum privacy, A/V equipment and seating for about a dozen guests. 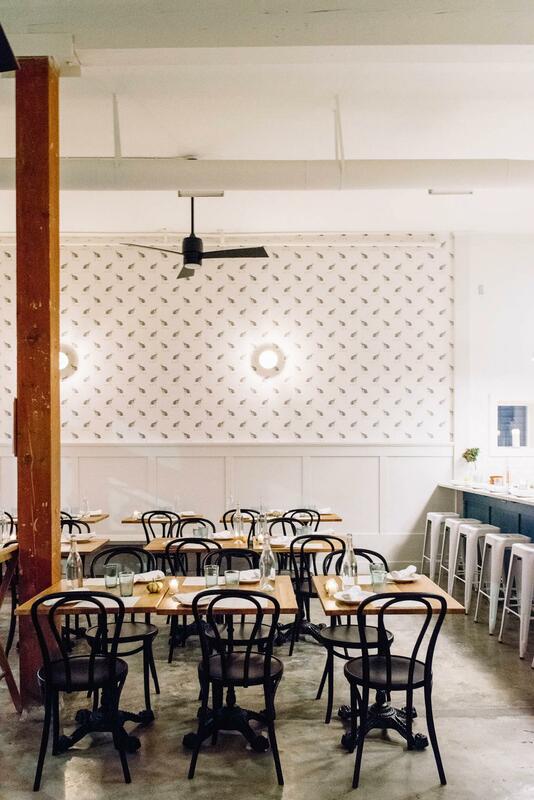 James Beard award-winning chef Gabriel Rucker (Le Pigeon, Little Bird Bistro) is behind Portland’s latest French restaurant darling, Canard. Though calling it French is oversimplifying Rucker’s clever concoctions of crispy calamari banh mi, clam ceviche nachos, and pork and eel terrine. 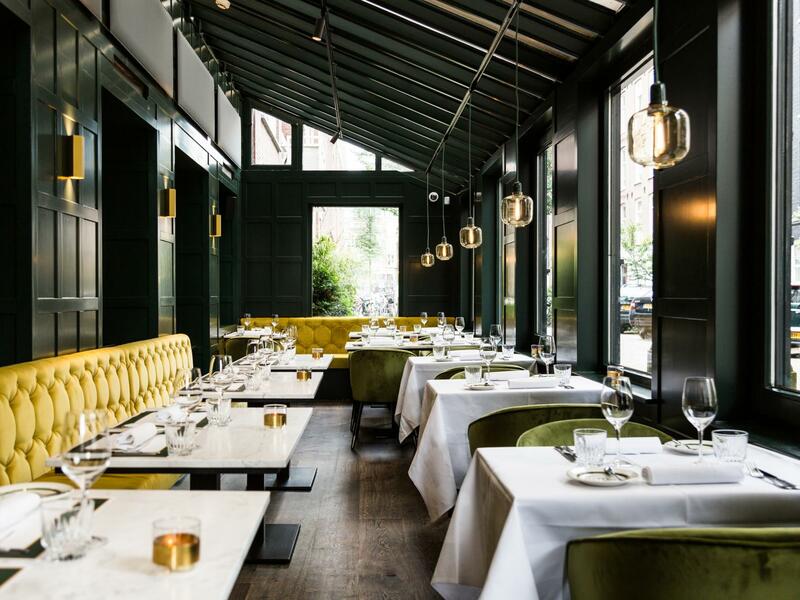 Opened in spring 2018, Canard is also a semifinalist on the James Beard award list for Best New Restaurant. 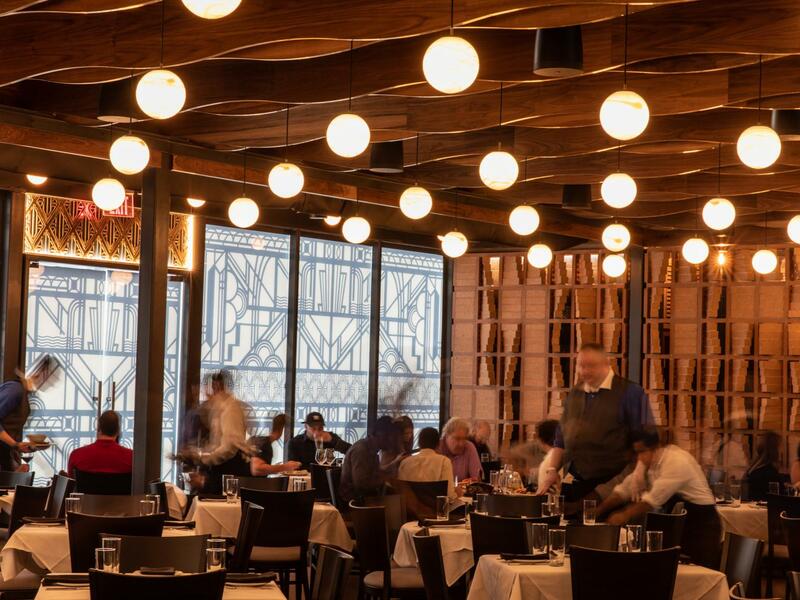 Group Dining: Dining at Canard is strictly no-reservations, so if you’re planning to visit with a group, we’d suggest keeping it on the smaller side and heading in early. And while we’re making suggestions, don’t leave without trying the foie gras dumplings. 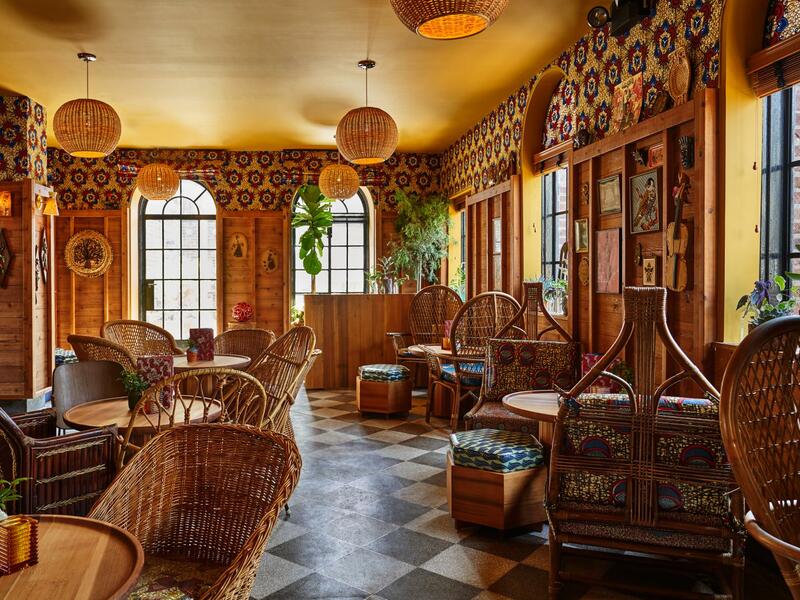 You’ll walk through the gardens of Chateau Marmont to get to this hidden Japanese restaurant. Cocktails include such offerings as the Mukashi with Akashi ume whisky, ginger syrup, shiso leaf and whisky vanilla soaked cherry, while the chef’s tasting menus are a great way to experience a similarly dynamic flavor palate. 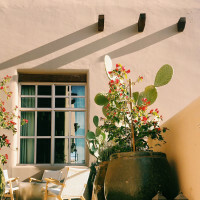 Group Dining: The outdoor courtyard is the prettiest and largest spot for private dining, but there are indoor options for more intimate groups too. 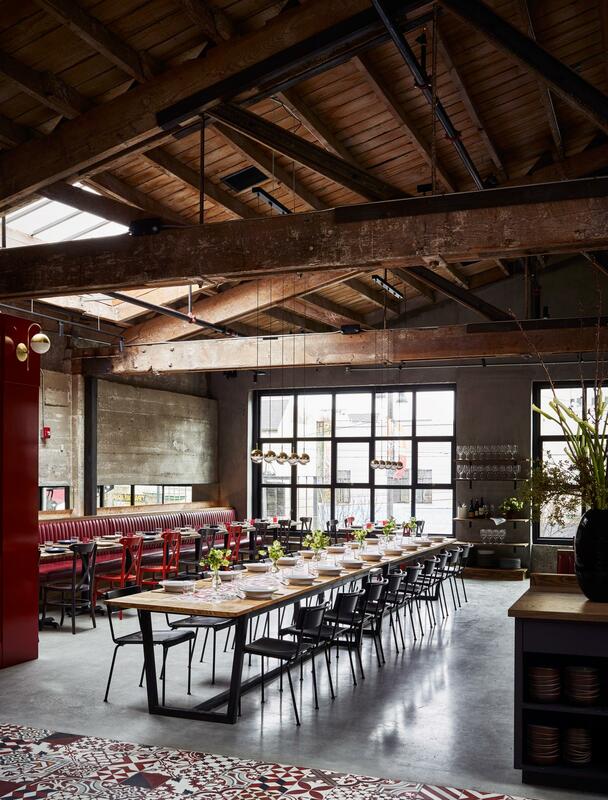 This 116-seat restaurant by celebrated SF chef Joshua Skenes (Saison) looks right out onto the Bay and it’s easy to feel that land-sea connection play out in the menus. 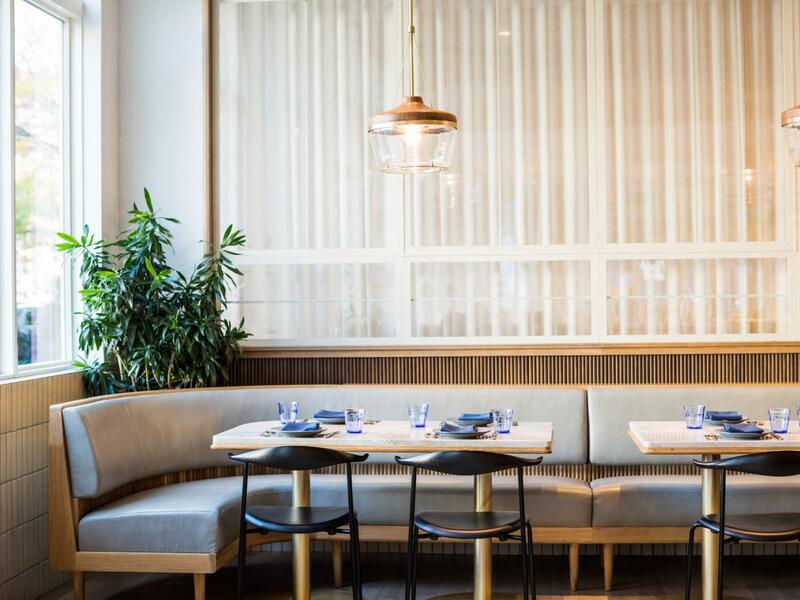 Open since September 2018, Angler’s a semifinalist for a James Beard award nomination as Best New Restaurant. Group Dining: The Game Room offers a private dining space with its own bar and floor-to-ceiling windows that look out to the Bay. It’s a great option for corporate parties and off-site events. Authentic, familial, shareable Indian curries, biryani, saag paneer and more have New Yorkers trekking all the way out to industrial Long Island City for what’s being praised as some of the city’s best Indian fare. 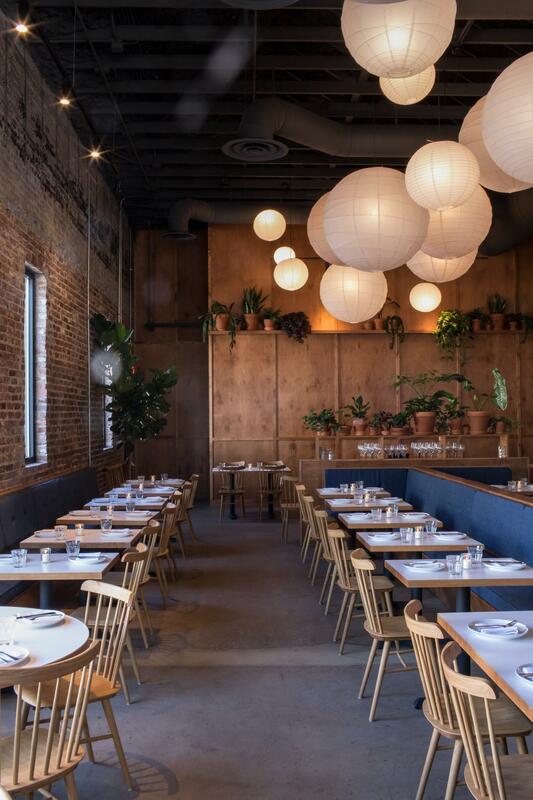 Adda, open since September 2018, is a semifinalist for a James Beard award nomination as Best New Restaurant. Group Dining: For dining with 6 guests, there’s a communal table that’s just the right size set in the front window. James Beard award-winning chef Nina Compton has been bringing a Caribbean approach to Louisiana cooking since the launch of Compére Lapin in 2015. 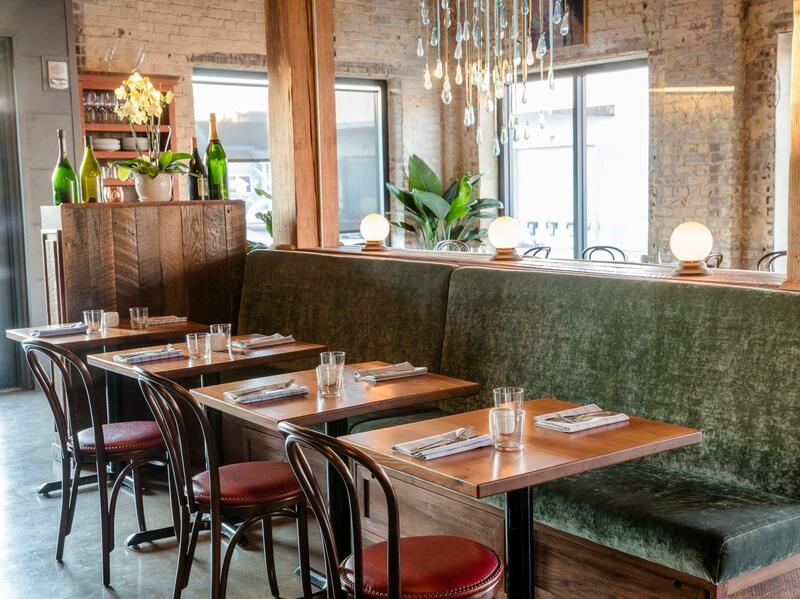 With her latest project, Bywater American Bistro, which opened in mid-2018, rave reviews and delicious dishes continue to roll in a space that’s part neighborhood haunt and part destination eatery. Group Dining: Options abound for small group dining, including a semi-private space off the main dining room. Located in the trendy neighborhood of Cedofeita, EARLY serves a seasonal menu that changes weekly including some beautiful, extravagant boards that are fun to share. Dinner is only served on Fridays, with EARLY being a great option for breakfast, lunch or afternoon pick-me-ups the rest of the week. Group Dining: The former bank vault here has been transformed into an intimate dining area for groups of up to six guests. A buyout of the space brings seating for about 40 guests or standing room for up to 60. The menu at Gran Castor is almost as fun and playful as the bold dining space. Think all the comfort foods in one spot -- pizzas, tacos, rice bowls, burritos, nachos -- plus margaritas. Group Dining: This place doesn’t take reservations, even for large groups. So, you’re going to want to be creative if you head here with a crowd and go on the earlier side so you can have cocktails and nachos while waiting on the right size space to free up. Other than that, the place screams fiesta at all hours. 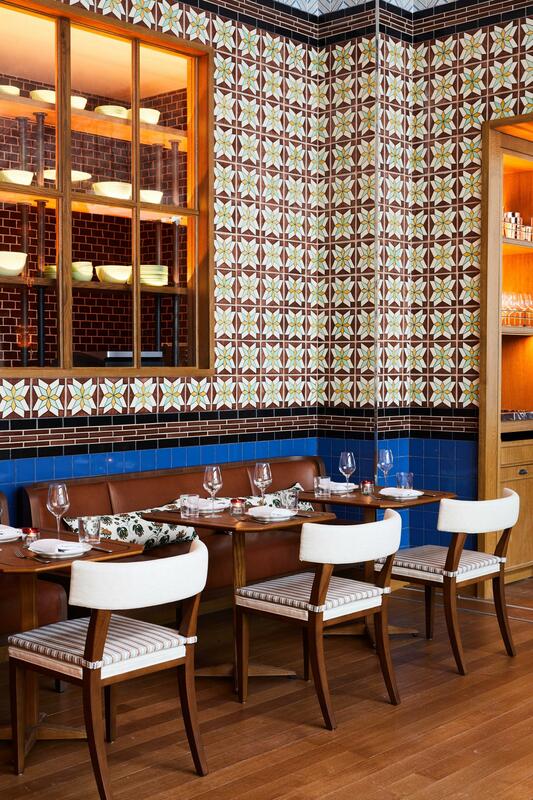 Contemporary Spanish tapas are the mainstay at this warm, welcoming Hong Kong restaurant. 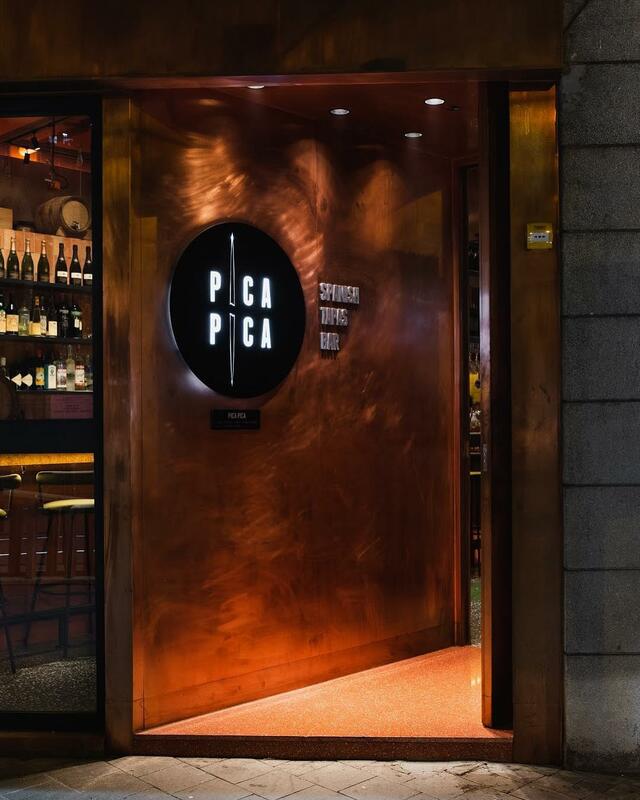 Pica Pica focuses on small plates that can be shared easily amongst friends, family or colleagues, bringing a heavy seafood presence to the table. Group Dining: For parties of six or more, you can reserve ahead and request a customized dining menu for the occasion. 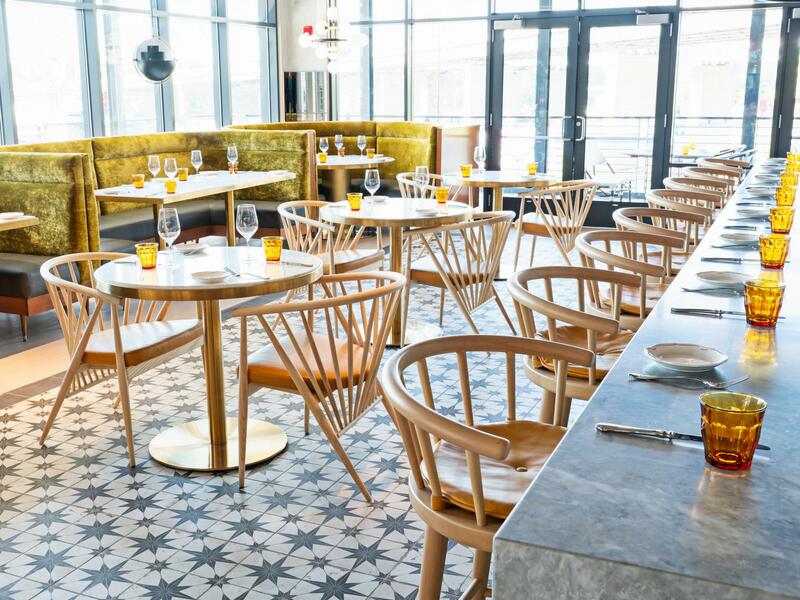 Opened in February 2019, Boston’s newest Italian enoteca and restaurant is the brainchild of James Beard award-winning chef Karen Akunowicz (Myers + Chang). 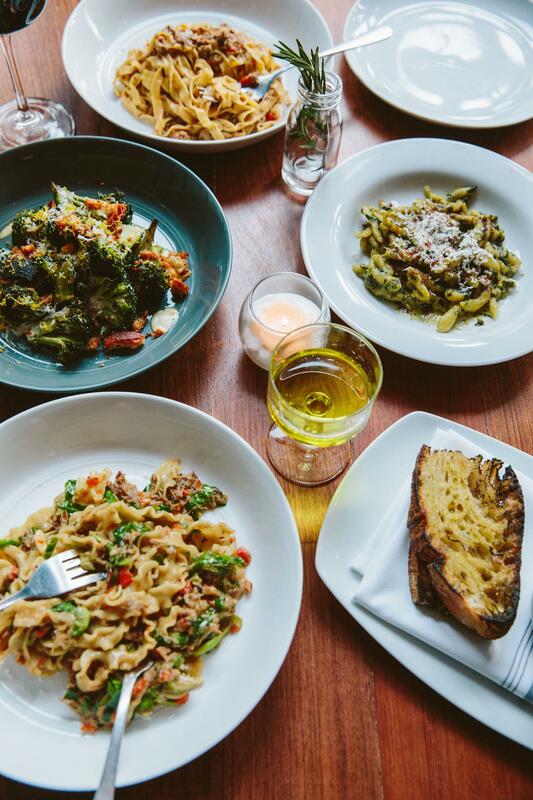 Think freshly baked focaccia stuffed with melted Taleggio, hand-rolled pastas with pistachio pesto, grilled broccoli Caesar salad, and harissa braised lamb with polenta. 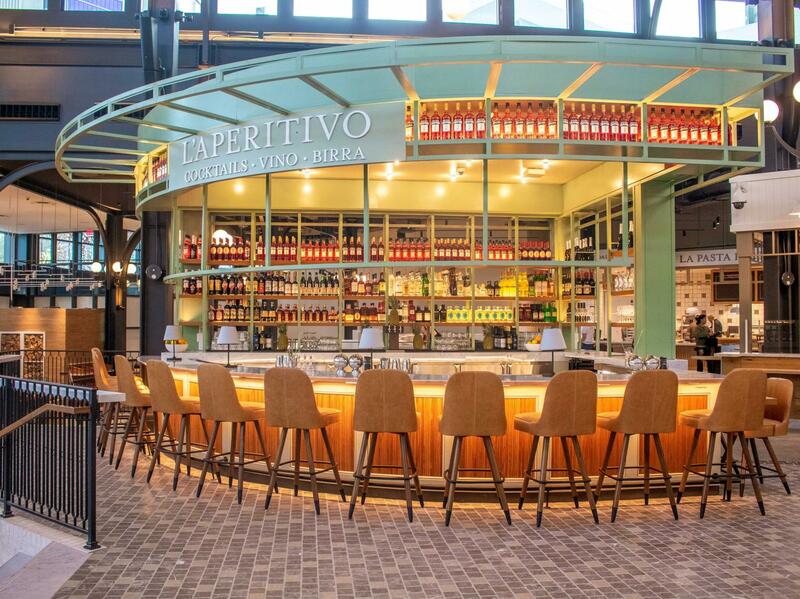 Group Dining: The daily aperitivo offering here makes a fun stop for any group looking for something casual pre-dinner. The restaurant seats 75 and doesn’t have a private dining room, but can accommodate large groups of up to around 30 guests if you book in advance. 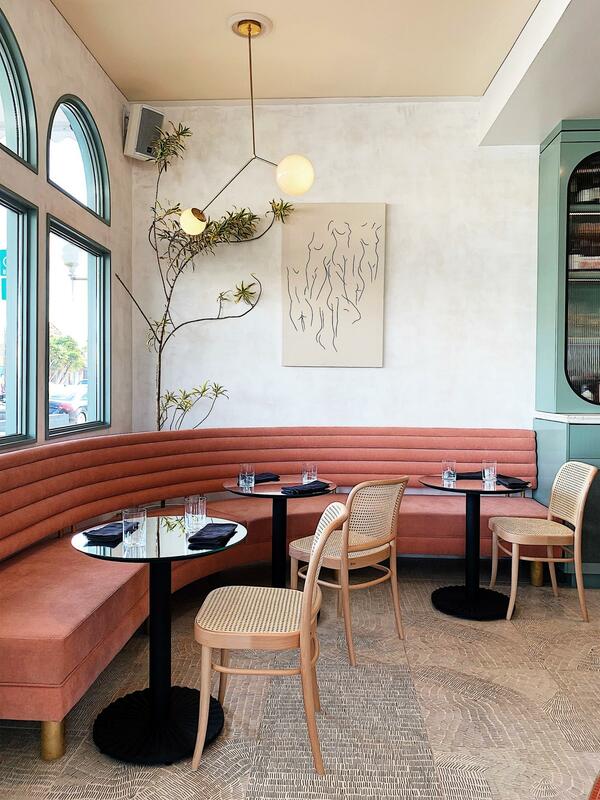 Set in the heart of LA’s Arts District, Simone offers produce-driven fare by the likes of James Beard Award-winning chef Jessica Largey. An important hub of the restaurant is its six-seat chef’s counter that offers a special tasting menu a few nights a week. ​Group Dining: Two private dining spaces are available at Simone, one fit for a party of 12 gathered at a round table, and the other coming in at double the seats in a long, narrow space with velvety banquettes. Mid-city sets the scene for James Beard award-winning chef Sue Zemanick’s (Gautreau’s Restaurant) new Zasu Restaurant. The menus here uses the gamut of both local ingredients and non-native, creating dishes that remind guests that New Orleans is a food city that isn’t solely reliant on Cajun and Creole flavors. Almond-crusted grouper, beef bourguignon, curried grilled lobster, and grilled octopus are just a few of the plates large and small you might spot on the menu. Group Dining: For private lunches or events, the beautifully designed space can seat up to 40 guests. Bardea Food & Drink is focused on bringing modern Italian cuisine to downtown Wilmington working with only the best of local Delaware Valley farms and purveyors. 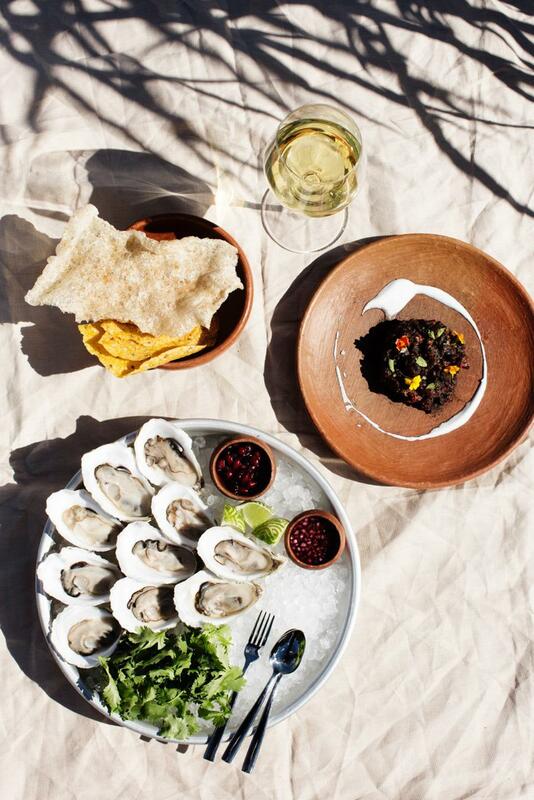 There’s lunch and dinner service, with a midday snack menu with raw bar and pizzas in between. Group Dining: The space seats 120 guests, with options to do a buyout or semi-private booking for a smaller crowd. 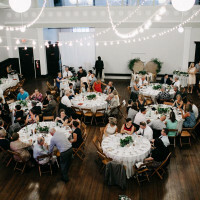 The space lends well to business gatherings, social celebrations, birthdays, and so forth. 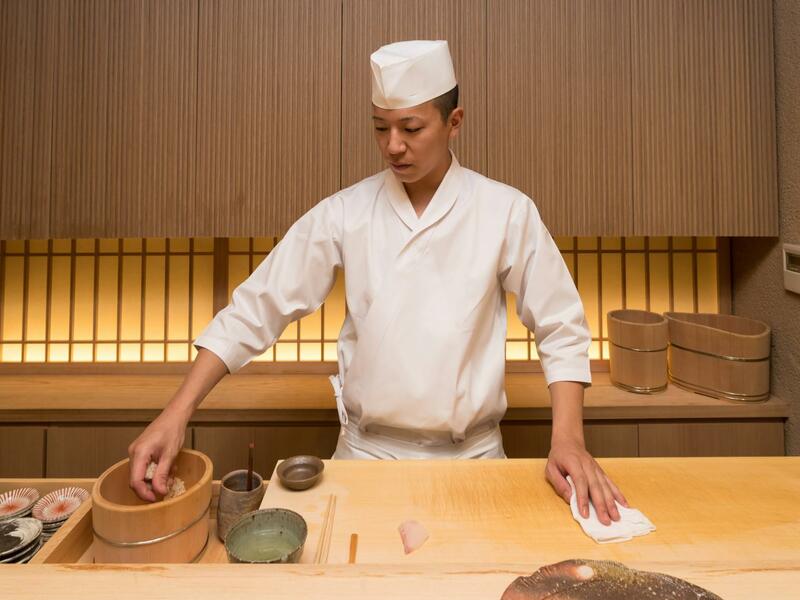 Inspired heavily by intricate Japanese craft, sushi becomes a kind of art form at this chef’s counter in the Aman Tokyo Resort. Musashi is the kind of place where you go not just to eat, but to learn about Omakase, Edomae, Shari and the finest ingredients and craftsmanship that can be found locally. Group Dining: Musashi is a chef interaction dining experience where guests are served at a small 8-seat Hinoki wooden counter. As such, it’s a stand-out option if you’re dining with a very small group. 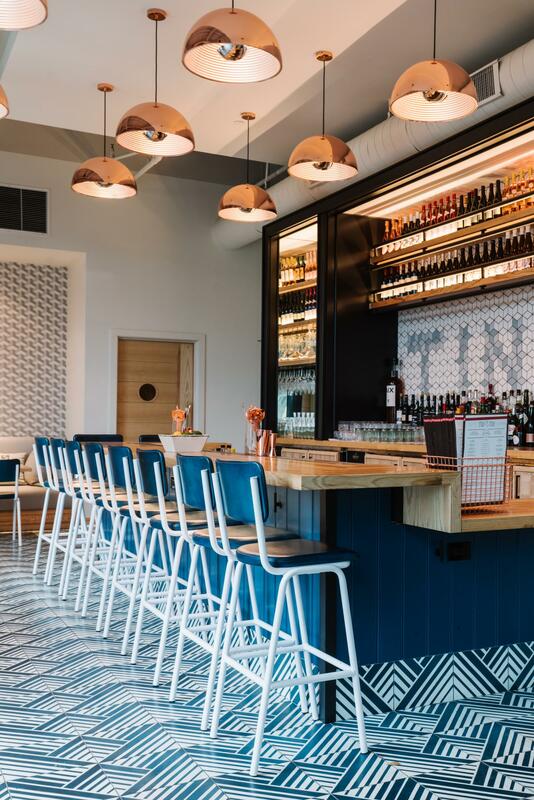 James Beard award-winning chef Chris Shepherd is behind this fun-spirited steakhouse in Houston’s Montrose neighborhood that has the chef nominated for a new James Beard award in the Outstanding Chef category. 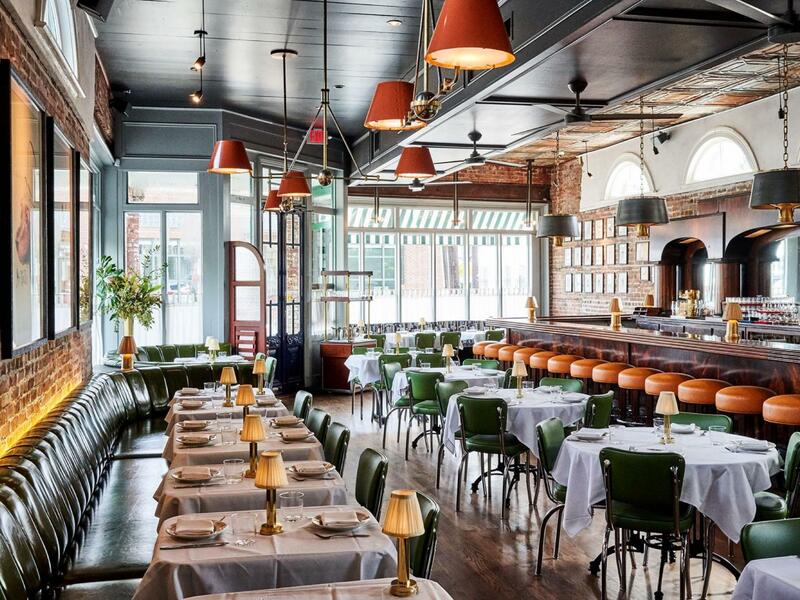 At Georgia James, diners can expect cast-iron steaks, decadent side dishes and lots of seafood. Group Dining: There are two private dining rooms at Georgia James, each seating 35 guests. The two rooms can be opened up and combined for a larger group of up to 70 guests. 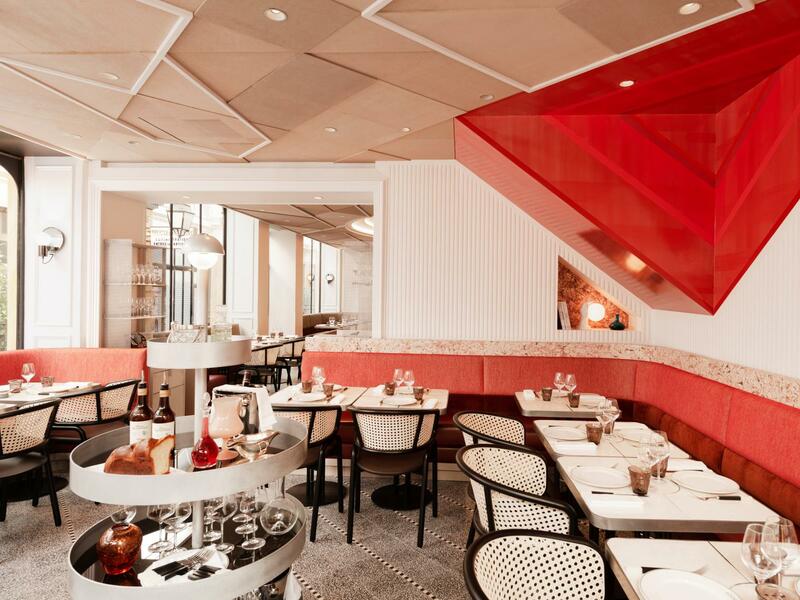 Michelin starred chef Gerald Passedat’s Lutetia Brasserie serves classic Parisian fare in a fresh, modern atmosphere. Multi-course tasting menus are available at the Sea Bar. Group Dining: For group dining of the most intimate and luxurious sort, you’ll want to book the private dining suite. 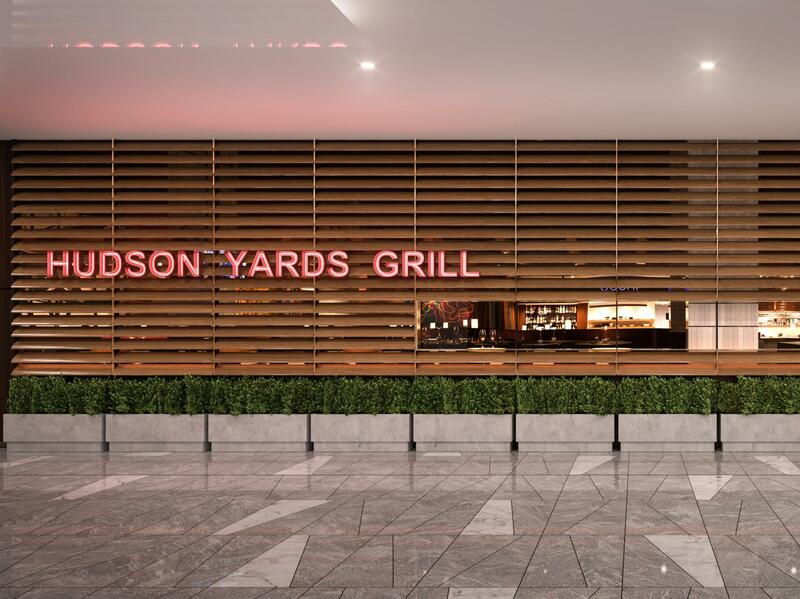 Opening March 15th, Hudson Yards will be home base for 25 eating, dining, drinking and snacking spots. 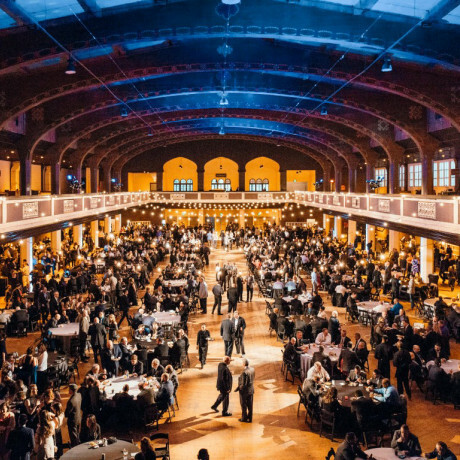 Thomas Keller and David Chang are just a couple of the celebrity chefs with outposts at this massive West Side hub. Group Dining: Hudson Yards is the largest privately built real estate project in US history, logging in at twice the size of The World Trade Center. Within these walls will be various event options and possibilities for private functions or group outings and meals. 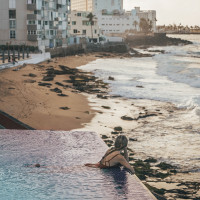 This 30-seat restaurant in Cartagena has been widely praised for its Caribbean approach to gastronomy. The dining space is undeniably beautiful and rooted in a sense of place, while the same could be said for the artfully plated dishes. 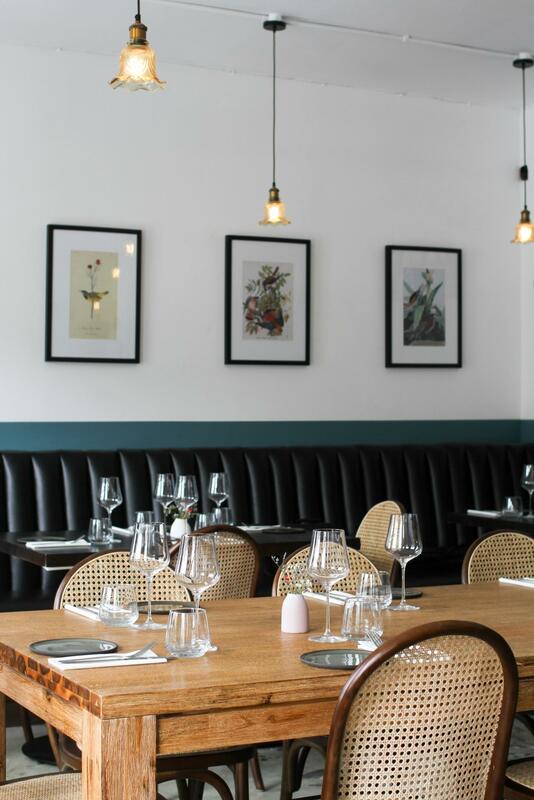 Group Dining: We’d recommend chatting with the team at Celele to get the group experience you’re looking for, as this tiny place is probably best suited to smaller dining groups. 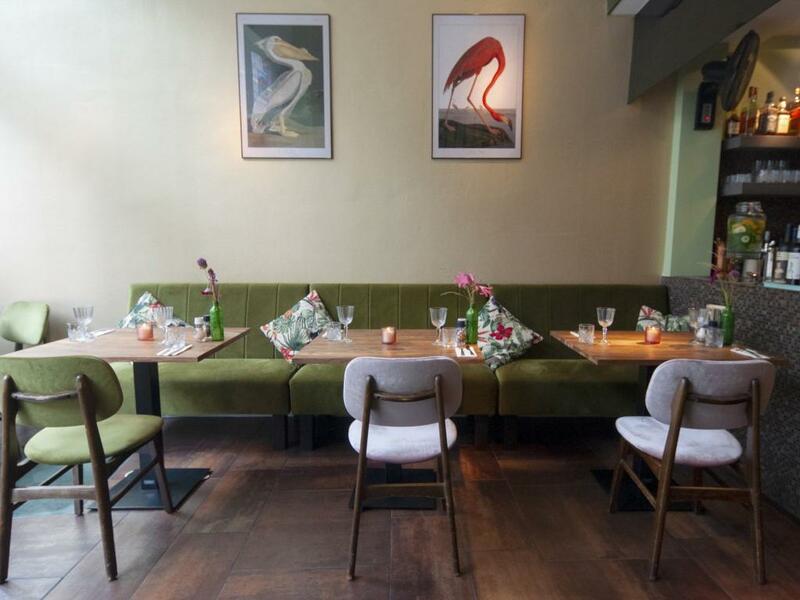 This 38-seat restaurant is located on the oldest street in Nijmegen. The menu here reflects street food from a number of international destinations, while the vibe inside is a comfy, sophisticated, tropical space. Group Dining: Intimate dinners on the upper mezzanine work well if you’ve got a group of less than 20 guests. Otherwise, a buyout of the whole space is a great way to have privacy and standing room for up to 50 guests. Detroit-style pizzas from a Brooklyn pizzeria are now available at The Gulch in Nashville. Once you’ve let that big statement sink in, mosey on over to check out the burrata pizzas, double stack pretzel-bunned burgers and waffle fries. 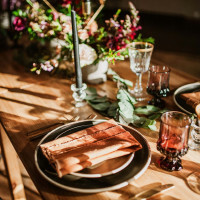 Group Dining: The restaurant seats up to 60 and can be bought out for privacy’s sake, or you can hire Emmy Squared to cater your next house party. A family-style menu makes dining with a group a thing of ease.